本发明提供即使在将两块玻璃基板的间隔变小的情况下，也可以通过抑制玻璃基板或密封层的裂缝或破裂等不良情况的发生，从而提高玻璃基板间的密封性和其可靠性的带密封材料层的玻璃构件。 The present invention provides even in the case where the spacer between two glass substrates becomes small, can also suppress the occurrence of defects like cracks or breakage of a glass substrate or a sealing layer, thereby to improve the sealing between the glass substrate and the reliability thereof a glass member with a sealing material layer. 玻璃基板3具有具备密封区域的表面3a。 A glass substrate having a surface 3 provided with a sealing area 3a. 在玻璃基板3的密封区域上形成厚度为15μm以下的密封材料层9。 The thickness of the sealing region formed on the glass substrate 3 of the sealing material layer 9 15μm or less. 密封材料层9由对密封用玻璃材料烧成而成的材料形成，该密封用玻璃材料含有密封玻璃、激光吸收材料和任选的低膨胀填料，激光吸收材料和作为任选成分的低膨胀填料的总量在2～44体积％的范围内。 9 by a sealing material layer formed on the glass material for sealing materials made of baking the sealing glass material comprising a sealing glass, low-expansion filler low-expansion filler and a laser absorbent material optionally, laser absorbent and as optional components the total amount in the range of 2 to 44% by volume. 密封材料层9的材料的热膨胀系数α1与玻璃基板3的热膨胀系数α2的差被设定在15～65×10-7/℃的范围内。 Coefficient of thermal expansion of the sealing material layer 9 are α1 α2 thermal expansion coefficient difference between the glass substrate 3 is set in a range of 15 ~ 65 × 10-7 / ℃ of. 本发明涉及带密封材料层的玻璃构件以及使用该构件的电子器件及其制造方法。  The present invention relates to a glass member provided with a sealing material layer and a manufacturing method and an electronic device using the member. 有机EL显不器（有机电致发光显不器，Organic Electro-Luminescence Display :0ELD)、等离子体显示器（PDP)、液晶显示装置（IXD)等平板型显示装置（FPD)采用如下结构：将形成有发光元件等的元件用玻璃基板和密封用玻璃基板相向配置，用将这两块玻璃基板密封而得的玻璃封装将显示元件密封（参照专利文献1)。  The organic EL display is not (organic electroluminescent device is not significant, Organic Electro-Luminescence Display: 0ELD), plasma display panel (PDP), a liquid crystal display device (IXD) type flat panel display devices (FPD) using the following structure : the element is formed with a light-emitting element arranged facing the glass substrate and the sealing glass substrate, obtained by sealing a glass package comprising two such glass substrates sealed display element (see Patent Document 1). 对于染料敏化型太阳能电池之类的太阳能电池，也对采用以两块玻璃基板将太阳能电池元件（光电转换元件）密封而得的玻璃封装的技术方案进行了研究（参照专利文献2)。 For the dye-sensitized solar cell of the solar cell or the like, but also with two glass substrates for solar cell element (photoelectric conversion element) sealed glass package obtained by the technical solution have been studied (refer to Patent Document 2). 作为将两块玻璃基板之间密封的密封材料，耐湿性等优良的密封玻璃的应用越来越多。  As a seal between the two glass substrates, a sealing material, application of sealing glass excellent in the moisture resistance more. 由于密封玻璃的密封温度为400〜600°C左右，因此用加热炉进行烧成的情况下，导致OEL元件或染料敏化型太阳能电池元件的电子元件部的特性劣化。 Since the sealing temperature of the sealing glass is about 400~600 ° C, so in the case of a firing furnace, resulting in characteristics of the electronic element portion of the OEL element or a dye-sensitized solar cell element is deteriorated. 于是，尝试在设置于两块玻璃基板的周边部的密封区域之间配置包含激光吸收材料的密封材料层（密封用玻璃材料层），对其照射激光进行加热、使其熔融以形成密封层（参照专利文献1、2)。 Thus, attempts between the two glass substrates provided in a peripheral portion of the sealing region is disposed a sealing material layer (sealing glass material layer) containing a laser absorbing material, it is heated by irradiation with a laser, to form a sealing layer melted ( Referring to Patent documents 1 and 2). 采用激光照射的密封（激光密封）可抑制热量对电子元件部的影响，但存在玻璃基板或密封层容易产生裂缝或破裂等的难点。  The sealing laser irradiation (laser sealing) can suppress thermal influences on the electronic element portion, but the presence of a glass substrate or the sealing layer prone to cracks or breakage of difficulty. 作为其原因之一，可例举玻璃基板与密封玻璃的热膨胀系数的差。 As one of the reasons, the glass substrate and the difference in the coefficient of thermal expansion of the sealing glass may be exemplified. 对于这一点，专利文献2中记载了与玻璃基板的热膨胀系数的差在IOX 1(T/°C以下的密封材料。由于密封玻璃通常比玻璃基板具有更大的热膨胀系数，因此在向密封玻璃中添加激光吸收材料的同时，添加二氧化硅、氧化铝、氧化锆、堇青石等低膨胀填料使得密封材料的膨胀变小。 For this, Patent Document 2 describes the difference in the coefficient of the glass substrate thermally expandable sealing material IOX 1 (T / ° C or less. Since the sealing glass generally has a larger thermal expansion coefficient than the glass substrate, and therefore the sealing glass added laser absorbing material at the same time, adding silica, alumina, zirconia, cordierite and other low-expansion filler such that the expansion of the sealing material becomes smaller. 然而，构成Fro和太阳能电池等的玻璃封装具有薄型化的倾向，因此，要求玻璃基板的间隔（Gap)变小以达到例如15μπι以下。  However, the glass sealing Fro constituting a solar cell and the like has a tendency to thinning, therefore, it requires an interval (Gap) of the glass substrate becomes small in order to achieve e.g. 15μπι less. 对于密封材料，如上所述掺入了低膨胀填料， 伴随着基板间隔的狭小化，产生了将填料粒子微粒化的要求。 For the sealing material, a low-expansion filler incorporated as described above, along with the narrowing of the gap between the substrates, resulting in the requirement of fine filler particles. 填料粒子的微粒化将招致比表面积的增大，用激光加热而熔融的密封玻璃与填料粒子之间的剪切应力增加而变得难以流动。 Micronized filler particles would lead to an increase in the specific surface area, and the shearing stress between the molten glass and the filler particles to increase the sealing becomes difficult to flow by laser heating. 因此，需要将使用激光的加工温度（加热温度）提高，但是如果加工温度过高，则会招致容易在玻璃基板或密封层产生裂缝或破裂等的问题。 Thus, using a laser processing temperature (heating temperature) needs to be improved, but if the processing temperature is too high, it will easily lead to a problem of cracks or breakage in the glass substrate or a sealing layer. 本发明的目的在于提供即使在将两块玻璃基板的间隔变小的情况下，也可以通过抑制玻璃基板或密封层的裂缝或破裂等不良情况的发生而提高玻璃基板间的密封性和其可靠性的带密封材料层的玻璃构件，还提供通过使用这样的带密封材料层的玻璃构件而提高了气密性及其可靠性的电子器件，以及该电子器件的制造方法。  The object of the present invention is to provide even when the interval between two glass substrates becomes small, may also be to improve the sealing between the glass substrates by suppressing the occurrence of defects like cracks or breakage of a glass substrate or a sealing layer and the reliability of the glass member with a sealing material layer is also provided through the use of such a glass member provided with a sealing material layer to improve the airtightness and reliability of the electronic device, and a method of manufacturing the electronic device. 本发明的带密封材料层的玻璃构件包括具有具备密封区域的表面的玻璃基板和形成在上述玻璃基板的上述密封区域上且厚度为15μπι以下的密封材料层，其中，上述密封材料层由对密封用玻璃材料烧成而成的材料形成，该密封用玻璃材料含有密封玻璃、激光吸收材料和任选的低膨胀填料，上述激光吸收材料和上述作为任选成分的低膨胀填料的总量在2〜44体积％的范围内，并且上述密封材料层的材料的热膨胀系数α 1与上述玻璃基板的热膨胀系数α2的差在15〜65(X1(T7/°C )的范围内。  The glass member provided with a sealing material layer according to the present invention comprises a glass substrate having a surface provided with a sealing region formed on the sealing region of the glass substrate and a thickness of the sealing material layer 15μπι or less, wherein the sealing material layer It is formed by baking the glass material for sealing materials made of the sealing glass material comprising a sealing glass, low-expansion low-expansion filler and a laser absorbent material optionally, the laser absorbing material and the filler as an optional component of the total an amount in the range of 2~44% by volume, and the coefficient of thermal expansion α within a sealing material layer (the range X1 (T7 / ° C) of a thermal expansion coefficient of the glass substrate α2 difference of 15~65. 本发明的电子器件包括具有具备第一密封区域的表面的第一玻璃基板、具有具备与上述第一密封区域相对应的第二密封区域的表面并且以上述表面与上述第一玻璃基板的上述表面相向的方式设置的第二玻璃基板、设置在上述第一玻璃基板和所第二玻璃基板之间的电子元件部、形成于上述第一玻璃基板的上述第一密封区域和上述第二玻璃基板的上述第二密封区域之间以密封上述电子元件部并且厚度为15 μ m以下的密封层，其中，上述密封层由密封用玻璃材料的熔融固着层形成，该密封用玻璃材料含有密封玻璃、激光吸收材料和任选的低膨胀填料，上述激光吸收材料和上述作为任选成分的低膨胀填料的总量在2〜44体积％的范围内，并且上述密封层的材料的热膨胀系数a 1与上述第一玻璃基板及第二玻璃基板中的至少一方的热膨胀系数α2的差在15〜65(X1(  The electronic device according to the present invention comprises a first glass substrate having a surface provided with a first sealing region, having a first sealing region provided with the above-described second sealing region corresponding to the surface and said surface of the first glass substrate, a second surface facing the glass substrate provided above, the electronic component provided at a first portion between the glass substrate and the second glass substrate, the first formed in the sealing region of the first substrate and the second glass between the second sealing region of the glass substrate to seal the electronic element portion and the sealing layer having a thickness of 15 μ m or less, wherein the sealing layer is formed from a molten glass material for sealing the fixing layer, the glass material for sealing comprises sealing glass, laser light absorbing material and optionally the low-expansion filler, the total amount of the low-expansion filler and a laser absorbent materials described above as optional ingredients in the range of 2~44% by volume, and the sealing material layer is a thermal expansion coefficient 1 of the first glass substrate and the second glass substrate to at least one of a thermal expansion coefficient α2 of the difference in 15~65 (X1 ( T7/°C )的范围内。 T7 / ° C) within a range. 本发明的电子器件的制造方法包括准备具有具备第一密封区域的表面的第一玻璃基板的工序；准备具有具备与上述第一密封区域相对应的第二密封区域和形成在上述第二密封区域上并且厚度为15 μ m以下的密封材料层的表面的第二玻璃基板的工序；使上述第一玻璃基板的上述表面与上述第二玻璃基板的上述表面相向，并隔着上述密封材料层将上述第一玻璃基板和上述第二玻璃基板层叠的工序；透过上述第一玻璃基板或者上述第二玻璃基板对上述密封材料层照射激光，使上述密封材料层熔融，从而形成将设置于上述第一玻璃基板和上述第二玻璃基板之间的电子元件密封的密封层的工序，其中，上述密封材料层由对密封用玻璃材料烧成而成的材料形成，该密封用玻璃材料含有密封玻璃、激光吸收材料和任选的低膨胀填料，上述激光吸收材料和上述  The method for producing an electronic device according to the present invention comprises a first step of preparing a glass substrate having a sealing region comprising a first surface; preparing a second sealing region provided with the first sealing region is formed corresponding to the first and the sealing region on the titanium surface and a thickness of sealing material layer of 15 μ m or less in the step of the second glass substrate; so that the said surface facing the first glass substrate and said surface of said second glass substrate, and via the sealing the material of the first layer of glass substrate and the second step of laminating a glass substrate; a first glass substrate, transmitted through the glass substrate or the second layer of the sealing material is irradiated with laser light, so that the sealing material layer is melted, thereby forming a set the electronic component between the first substrate and the second glass substrate sealing step of sealing glass layer, wherein the sealing material layer is formed on the glass material for sealing materials made of baking the sealing glass material comprising sealing glass, low-expansion filler and a laser absorbent material optionally, the laser absorbing material and the 为任选成分的低膨胀填料的总量在2〜44体积％的范围内，并且上述密封材料层的材料的热膨胀系数ai与上述第一玻璃基板和上述第二玻璃基板中的至少一方的热膨胀系数α2的差在15〜65 (X 1(T/°C)的范围内。 Is a low-expansion filler total amount of optional ingredients in the range of 2~44% by volume, and the coefficient of thermal expansion of the sealing material layer and the ai least one of the thermal expansion of the first glass substrate and the second glass substrate difference coefficient α2 in the range of 15~65 (X 1 (T / ° C) of. 发明的效果根据本发明的带密封材料层的玻璃构件和使用该构件的电子器件及其制造方法，即使在将两块玻璃基板的间隔变小的情况下，也能够抑制在进行激光密封时所产生的玻璃基板或密封层的裂缝或破裂等。  According to the glass member provided with a sealing material layer according to the present invention, an electronic device and its manufacturing method and use of the member, even in the case where the distance between two glass substrates becomes small, it can be suppressed during the laser cracks or rupture of a glass substrate or a sealing layer sealing generated. 因而，可以再现性良好地提供能够提高玻璃基板间的密封性和其可靠性、进而提高了气密性和其可靠性的电子器件。 Accordingly, it is possible to provide good reproducibility can be enhanced between the glass substrate and the sealing reliability, thereby improving the airtightness and reliability of the electronic device. 图1是表示本发明的实施方式的电子器件的结构的剖视图。  FIG. 1 is a sectional view showing a configuration of an electronic device according to an embodiment of the present invention. 图2是表示本发明的实施方式的电子器件的制造工序的剖视图。  FIG. 2 is a sectional view showing a manufacturing process of an electronic device according to an embodiment of the present invention. 图3是表示图2所示的电子器件的制造工序中使用的第一玻璃基板的俯视图。  FIG. 3 is a plan view of a first glass substrate manufacturing step of the electronic device shown in FIG. 2 are used. 图4是沿图3的AA线的剖视图。  FIG. 4 is a cross-sectional view along line AA of FIG. 3. 图5是表示图2所示的电子器件的制造工序中使用的第二玻璃基板的俯视图。  FIG. 5 is a plan view of a second glass substrate manufacturing step of the electronic device shown in FIG. 2 are used. 图6是沿图5的AA线的剖视图。  FIG. 6 is a cross-sectional view along line AA of FIG. 图7是表示使用厚度为15 μ m以下的密封材料层经激光密封的玻璃基板的变形量和激光加工温度（加热温度）之间的关系的一例的图。  FIG. 7 is a diagram illustrating an example of a thickness of a relationship between the amount of deformation of the sealing material layer of 15 μ m or less by laser sealing glass substrate and the laser working temperature (heating temperature). 以下，参照附图对用于实施本发明的方式进行说明。  Hereinafter, with reference to the accompanying drawings of the present embodiment for carrying out the invention will be described. 图1是表示本发明的实施方式的电子器件的构成的图，图2是表示本发明的实施方式的电子器件的制造工序的图，图3 及图4是表示用于其的第一玻璃基板的构成的图，图5及图6是表示用于其的第二玻璃基板的构成的图。 FIG 1 is a diagram showing a configuration of an electronic device according to an embodiment of the present invention, FIG 2 is a view showing a manufacturing process of an electronic device according to an embodiment of the present invention, FIG. 3 and FIG. 4 is a diagram showing a first glass substrate thereof FIG configuration, FIG. 5 and FIG. 6 is a diagram illustrating the configuration of a second glass substrate thereof. 图1所示的电子器件1是构成OELD、PDP、LCD等FPD，使用OEL元件等发光元件的照明装置（0EL照明等）或者染料敏化型太阳能电池之类的太阳能电池等的电子器件。 The electronic device shown in  FIG. 11 is a configuration lighting apparatus OELD, PDP, LCD and the like of the light emitting element FPD, using OEL element or the like (0EL lighting, etc.) or a dye-sensitized solar cell of the solar cell or the like electronic devices. 电子器件1具备第一玻璃基板2和第二玻璃基板3。 The electronic device 1 includes a first glass substrate 2 and the second glass substrate 3. 第一玻璃基板2和第二玻璃基板3由例如具有各种公知的组成的无碱玻璃或钠钙玻璃等构成。 The first glass substrate 2 having, for example, the second glass substrate 3 composed of a variety of well-known alkali-free glass or soda lime glass, and the like. 无碱玻璃具有35〜40X 1(T7/°C左右的热膨胀系数。钠钙玻璃具有80〜90X 1(T7/°C左右的热膨胀系数。 Alkali-free glass having a thermal expansion coefficient of about 35~40X 1 (T7 / ° C. Soda lime glass having a thermal expansion coefficient of about 80~90X 1 (T7 / ° C.
 在第一玻璃基板2的表面2a和与其相向的第二玻璃基板3的表面3a之间设置有与电子器件1相对应的电子元件部4。  The electronic device 1 corresponding to the portion 4 is provided with the electronic device between the surface 3a of the second glass substrate surface 2a of the first glass substrate 2 and 3 opposed thereto. 例如如果是OELD或OEL照明，则电子元件部4具有OEL元件；如果是F1DP,则电子元件部4具有等离子体发光元件；如果是LCD，则电子元件部4具有液晶显示元件；如果是太阳能电池，则电子元件部4具有染料敏化型太阳能电池元件(染料敏化型光电转换元件）。 For example, if a OELD or OEL illumination, the electronic component unit 4 with an OEL element; if F1DP, the electronic element portion 4 has a plasma emission element; If an LCD, the electronic element portion 4 has a liquid crystal display element; if the solar cell is , the electronic element portion 4 has a dye-sensitized solar cell device (dye-sensitized photoelectric conversion element). 具有OEL元件之类的发光元件或染料敏化型太阳能电池元件等的电子元件部4具备各种公知的结构。 An electronic component having a light emitting element portion of the OEL element or the like or a dye-sensitized solar cell element 4 includes various known structures. 本实施方式的电子器件1对于电子元件部4的元件结构没有限定。 The electronic device according to the present embodiment is a structural element for an electronic component unit 4 is not limited. 图1所示的电子器件1中，第一玻璃基板2构成元件用玻璃基板，在其表面上形成有OEL元件或PDP元件等元件结构体作为电子元件部4。 The electronic device shown in  FIG. 1 1, the first glass substrate 2 with a glass substrate constituting element, there is a structure element OEL element or the like as an electronic component PDP element portion 4 is formed on the surface thereof. 第二玻璃基板3构成形成于第一玻璃基板2的表面的电子元件部4的密封用玻璃基板。 The second glass substrate 3 constituting the sealing glass is formed on the substrate surface of the first electronic element portion 4 of the glass substrate 2. 但是，电子器件1的结构不限定于此。 However, the structure of the electronic device 1 is not limited thereto. 例如，电子元件部4是染料敏化型太阳能电池元件等的情况下，在第一玻璃基板2和第二玻璃基板3的各表面2a、3a上形成有构成元件结构的布线膜或电极膜等元件膜。 For example, the electronic component unit 4 is the case where the dye-sensitized solar cell element, 2a, is formed with a film or a wiring electrode film 3a constituting the element structure on each surface of the first glass substrate 2 and the second glass substrate 3 element film. 构成电子元件部4的元件膜或基于这些元件膜的元件结构体形成于第一玻璃基板2和第二玻璃基板3的表面2a、3a中的至少一方。 Electronic components constituting the film of the element 4 or elements based on the element structure of these films is formed on the surface of the second glass substrate 2 and 3 of the first glass substrate 2a, 3a at least one of. 在用于制造电子器件1的第一玻璃基板2的表面2a上，如图3及图4所示，沿着形成电子元件部4的元件区域5的外周设置有第一密封区域6。  on the first surface 2a of the glass substrate 1 for manufacturing an electronic device 2, as shown in FIG. 3 and FIG. 4, the outer periphery of the element region 4 is provided with a first sealing region 6 is formed along a portion 5 of the electronic component . 第一密封区域6设置成围住元件区域5。 A first sealing region 6 is provided to surround the element region 5. 在第二玻璃基板3的表面3a上，如图5和图6所示设置有与第一密封区域6 相对应的第二密封区域7。 On the surface 3a of the second glass substrate 3, as shown in FIGS. 5 and 6 is provided with a first sealing region 6 and a second sealing region corresponding to 7. 第一密封区域6和第二密封区域7成为密封层的形成区域（对第二密封区域7而言是密封材料层的形成区域）。 A first sealing region 6 and the second sealing region 7 has a sealing layer formation region (in terms of the second sealing region 7 is formed in the region of the sealing material layer). 另外，根据需要，可以在第二玻璃基板3 的表面3a上也设置元件区域。 Further, if necessary, may be provided on the surface of the element region 3a of the second glass substrate 3. 以具有元件区域5和第一密封区域6的表面2a和具有第二密封区域7的表面3a 相向的方式隔着规定的间隙配置第一玻璃基板2和第二玻璃基板3。 A predetermined gap therebetween  In a surface region 5 having a surface region and a first sealing member 6 has a second sealing region 2a and 3a of 7 arranged facing the first glass substrate 2 and the second glass substrate 3. 第一玻璃基板2与第二玻璃基板3之间的间隙由密封层8密封。 2 and a second gap between the glass substrates sealed by a sealing layer 8 of the first glass substrate. 即，在第一玻璃基板2的密封区域6和第二玻璃基板3的密封区域7之间形成密封层8以密封电子元件部4。 I.e., the sealing region of the first glass substrate 2 and the sealing region 6 of the second glass substrate 3 of the sealing layer to seal the electronic component 8 is formed between the portion 7 4. 电子元件部4被由第一玻璃基板2、第二玻璃基板3和密封层8构成的玻璃面板气密密封。 4 is the electronic element portion 2, the glass panel hermetically sealing the second glass substrate 3 and the sealing layer 8 composed of a first glass substrate. 密封层8具有15 μ m以下的厚度τ。 A sealing layer 8 having a thickness of 15 μ m or less τ. 作为电子元件部4适用OEL元件等的情况下，在第一玻璃基板2和第二玻璃基板3 之间残存一部分空间。  As the case where the electronic element 4 applies OEL element portion, the remaining 3 between the first glass substrate 2 and the second glass substrate part of the space. 可以使这样的空间保持这样的状态，或者也可以填充透明的树脂等。 Such a space can maintain such a state, or may be filled with a transparent resin or the like. 透明树脂可以与玻璃基板2、3粘接，也可以仅与玻璃基板2、3接触。 A transparent resin may be, may be in contact only with the glass substrates 2 and 3 and the glass substrates 2 and 3 bonding. 此外，作为电子元件部4适用染料敏化型太阳能电池元件等的情况下，在第一玻璃基板2与第二玻璃基板3之间的整个间隙内配置电子元件部4。 Further, as a case where the electronic component unit 4 applies a dye-sensitized solar cell element or the like in the entire gap between the first glass substrate 2 and the second glass substrate, the electronic component unit 4 disposed. 密封层8由熔融固着层形成，所述熔融固着层通过激光使形成于第二玻璃基板3 的密封区域7的密封材料层9熔融后固着于第一玻璃基板2的密封区域6而成。  The sealant layer 8 is made of melt-bonding layer is formed, the molten fixing layer by the laser light 9 melted 7 sealing material layer is formed on the sealing region of the second glass substrate 3 fixed sealing region of the first glass substrate 2 to 6 and to make. 即，在用于制造电子器件1的第二玻璃基板3的密封区域7形成有如图5和图6所示的框状的密封材料层9。 That is, in a sealing region for the second glass substrate manufacturing an electronic device 3 is formed frame-like sealing material layer 9 there is shown in Figures 5 and 6, 7. 通过激光的热量使形成于第二玻璃基板3的密封区域7的密封材料层9熔融固着于第一玻璃基板2的密封区域6,从而形成密封第一玻璃基板2与第二玻璃基板3之间的空间（元件配置空间）的密封层8。 By the heat of the laser light formed on the second glass substrate 3 of the sealing region of the sealing material 9 molten layer 7 fixed to the first sealing region 6 of the glass substrate 2 to form a seal with the first glass substrate 2 between the second glass substrate 3 space (element configuration space) a sealing layer 8. 密封材料层9为将形成于玻璃基板3的密封区域7的密封用玻璃材料的层烧成而形成的层。  The sealing material layer 9 is formed on the layer of glass material for sealing glass substrate 3 of the sealing region 7 formed by firing the layer. 密封用玻璃材料包含密封玻璃、激光吸收材料和任选的低膨胀填料，而且，还可以根据需要包含除这些以外的添加材料。 Glass material for sealing comprises sealing glass, a laser absorbent and optionally a low-expansion filler, and may be added in addition to these materials as needed contained. 下面，将激光吸收材料和低膨胀填料统称为"填料"。 Hereinafter, the laser absorbent and a low-expansion filler collectively referred to as "fillers." 密封用玻璃材料包含密封玻璃和填料，还可以根据需要包含其它的添加材料。 Glass material for sealing comprises sealing glass and a filler, may also contain other added materials as needed. 作为其它的添加材料，有除激光吸收材料和低膨胀填料以外的填料等。 As other additive materials, there is in addition to the laser absorbent material and a filler other than the low-expansion filler. 但是，如下所述，作为其它的添加材料，不包括烧成时消失的成分。 However, as described below, as another additive, which disappears when fired component is not included. 为了进行下述的膨胀系数调整，密封用玻璃材料较好是作为填料除激光吸收材料以外包含低膨胀填料。 In order to adjust the coefficient of expansion below, the glass material for sealing is preferably used as a filler in addition to the laser absorbent material comprises a low-expansion filler. 密封玻璃（玻璃料）采用例如锡-磷酸类玻璃、铋类玻璃、钒类玻璃、铅类玻璃等低熔点玻璃。  The sealing glass (glass frit) using e.g. tin - phosphate glass, bismuth glass, vanadium glass, lead glass of low melting glass. 其中，考虑到对玻璃基板2、3的密封性（粘接性）及其可靠性（粘接可靠性和密闭性）以及对环境和人体的影响等，较好是使用由锡-磷酸类玻璃或铋类玻璃形成的密封玻璃。 Wherein, taking into account the sealability of the glass substrates 2 and 3 (adhesion) and the reliability (bonding reliability and tightness) and the impact on the environment and human body, it is preferred to use a tin - phosphate glass glass or bismuth glass seal formation. 锡-磷酸类玻璃（玻璃料）较好是具有20〜68摩尔％的Sn0、0. 5〜5摩尔％的SnO2及20〜40摩尔％的P2O5 (基本上将总量设为100质量％ )的组成。  Tin - Sn0,0 5~5 mole% and the mole% of SnO2 20~40 P2O5 phosphate glass (glass frit) preferably has 20~68 mol% (to the total amount of substantially 100 % by mass) of the composition. SnO是用于使玻璃的熔点降低的成分。 SnO is to reduce the melting point for the glass composition. 如果SnO的含量不足20摩尔％，则玻璃的粘性升高，密封温度变得过高，如果超过68摩尔％，则无法玻璃化。 If the content of SnO is less than 20 mol%, the viscosity of the glass is increased, the sealing temperature becomes too high, and if it exceeds 68 mol%, the glass can not. SnO2是用于使玻璃稳定化的成分。  SnO2 is a component for stabilizing the glass. 如果SnO2的含量不足0. 5摩尔％，则密封操作时软化熔融的玻璃中有SnO2分离、析出，流动性受损，密封操作性下降。 If the SnO2 content is less than 0.5 mol%, the softening and melting the sealing operation when the glass has SnO2 separation, precipitation, impaired mobility, decreased sealing operability. 如果SnO 2的含量超过5摩尔％，则容易从低熔点玻璃的熔融过程中析出Sn02。 If the content of SnO 2 exceeds 5 mol%, it is likely to precipitate from the molten Sn02 low melting glass. P2O 5是用于形成玻璃骨架的成分。 P2O 5 is a component for forming the skeleton of glass. 如果P2O5的含量不足20摩尔％，则无法玻璃化，如果其含量超过40质量％，则可能会导致作为磷酸盐玻璃特有的缺点的耐候性的劣化。 If the content of P2O5 is less than 20 mol%, the glass can not, if the content exceeds 40% by mass, it may cause deterioration of the glass as a drawback specific to phosphate weather resistance. 在这里，玻璃料中的SnO和SnO2的比例（摩尔％ )可以如下求得。  Here, the ratio of the glass frit of SnO and SnO2 (mol%) can be determined as follows. 首先，将玻璃料(低熔点玻璃粉末）酸性分解后，通过ICP发光分光分析测定玻璃料中所含的Sn原子的总量。 First, after the glass frit (low-melting glass powder) acidic decomposition, measured by ICP emission spectroscopic analysis of the total amount of Sn atoms contained in the glass frit. 接着，对酸性分解后的产物可以通过碘滴定法来求出Sn 2+(SnO)，因此从Sn原子的总量中减去如上所述求得的Sn2+的量而求出Sn4+(SnO 2)。 Next, after the acid decomposition products may be determined by iodometric titration Sn 2+ (SnO), determined as described above by subtracting the amount of Sn2 + in the total amount of Sn atom is obtained and Sn4 + (SnO 2) . 由上述3种成分形成的玻璃的玻璃化温度低，适合用于低温用的密封材料，但也可以含有SiO2 等形成玻璃骨架的成分和ZnO、B203、A1203、W03、M〇0 3、Nb205、Ti02、Zr02、Li 20、 Na20、K20、Cs20、MgO、CaO、SrO、BaO等使玻璃稳定化的成分等作为任意成分。  The low glass transition temperature of the glass formed by the above three components, the sealing material is suitable for low temperature, but may contain components such as SiO2 forming the skeleton of glass and ZnO, B203, A1203, W03, M〇0 3 , Nb205, Ti02, Zr02, Li 20, Na20, K20, Cs20, MgO, CaO, SrO, BaO and other component to stabilize glass and the like as optional components. 但是，如果任意成分的含量过多，则可能会导致玻璃变得不稳定而发生失透，或者玻璃化温度和软化点升高，因此任意成分的总量较好是在30摩尔％以下。 However, if the content of the optional component is too high, it may cause glass devitrification becomes unstable, and the glass transition temperature or the softening point increases, so the total amount of any component is preferably 30 mol% or less. 此时的玻璃组成调整为使得基本成分和任意成分的总量基本上为100质量％。 At this time, the glass composition is adjusted so that the basic component and optional components of the total amount of substantially 100% by mass. 铋类玻璃（玻璃料）较好是具有70〜90质量％的扮203、1〜20质量％的ZnO及2〜12质量％的B 2O3 (基本上将总量设为100质量％ )的组成。  The bismuth glass (glass frit) preferably has a play of 70~90 mass% mass% of ZnO and 203,1~20 2~12 mass% of B 2O3 (substantially the total amount 100 mass% ) composition. Bi2O3是形成玻璃的网络的成分。 Bi2O3 is a component for forming a glass network. 如果Bi2O 3的含量不足70质量％，则低熔点玻璃的软化点升高，难以在低温下密封。 If the content is less than 70 Bi2O 3 mass%, the softening point of the low melting glass is increased, it is difficult to seal at a low temperature. 如果Bi2O 3的含量超过90质量％，则难以玻璃化，并且有热膨胀系数过高的倾向。 If Bi2O 3 content exceeds 90 mass%, vitrification becomes difficult, and there tends to excessively high thermal expansion coefficient. ZnO是降低热膨胀系数等的成分。  ZnO is lower the thermal expansion coefficient or the like. 如果ZnO的含量低于1质量％，则难以玻璃化。 If the content of ZnO is less than 1 mass%, vitrification becomes difficult. 如果ZnO的含量超过20质量％，则低熔点玻璃成形时的稳定性下降，容易发生失透。 If the content of ZnO exceeds 20 mass%, the stability is degraded when the low-melting glass forming, devitrification is likely to occur. B 2O3是形成玻璃骨架并扩大可玻璃化的范围的成分。 B 2O3 is a component to form a glass skeleton and to expand the vitrification range. 如果B2O 3的含量不足2质量％，则难以玻璃化，如果超过12质量％，则软化点过高，密封时即使施加负荷也难以在低温下密封。 B2O 3 If the content is less than 2 mass%, vitrification becomes difficult, and if it exceeds 12 mass%, the softening point is too high, even when a load is applied when the seal is difficult to seal at a low temperature. 由上述3种成分形成的玻璃的玻璃化温度低，适合用于低温用的密封材料，但也可以含有A1203、Ce02、Si02、Ag20、M〇0 3、Nb205、Ta205、Ga 203、Sb203、Li20、Na 20、K20、Cs20、CaO、 Sr0、Ba0、W03、P205、Sn0x(x为I或2)等任意成分。  The low glass transition temperature of the glass formed by the above three components, the sealing material is suitable for low temperature, but may contain A1203, Ce02, Si02, Ag20, M〇0 3, Nb205, Ta205, Ga 203, Sb203, Li20, Na 20, K20, Cs20, CaO, Sr0, Ba0, W03, P205, any component Sn0x (x is I or 2) and the like. 但是，如果任意成分的含量过多，则可能会导致玻璃变得不稳定而发生失透，或者玻璃化温度和软化点升高，因此任意成分的总量较好是在30质量％以下。 However, if the content of the optional component is too high, it may cause glass devitrification becomes unstable, and the glass transition temperature or the softening point increases, so the total amount of any component is preferably 30 mass% or less. 此时的玻璃组成调整为使得基本成分和任意成分的总量基本上为100质量％。 At this time, the glass composition is adjusted so that the basic component and optional components of the total amount of substantially 100% by mass. 密封用玻璃材料包含作为填料的激光吸收材料和低膨胀填料。  As the glass material for sealing containing a laser absorbing material and a filler low-expansion filler. 但是，由于仅有激光吸收材料时也可能获得作为填料的功能，因此低膨胀填料为任选成分，也可不必一定含有低膨胀填料。 However, since only the laser can also function as a filler to obtain the absorbent material, the low-expansion filler is an optional component, may not necessarily contain a low-expansion filler. 激光吸收材料是必需成分，用来通过激光加热由烧成密封用玻璃材料的层而形成的密封用玻璃层9使其熔融。 Laser absorbent component is required for heating the sealing glass layer is a layer of fired glass material for sealing is formed by a laser 9 melted. 这样，密封用玻璃材料除含有密封玻璃以外，还含有作为必需成分的激光吸收材料、或者激光吸收材料和低膨胀填料。 Thus, in addition to glass material for sealing comprises sealing glass further contains as an essential component of the laser light absorbing material, or a laser absorbent and a low-expansion filler. 作为激光吸收材料，可使用选自Fe、Cr、Mn、Co、Ni和Cu的至少1种金属或包含所述金属的氧化物等化合物。  compound as a laser light absorbing material, may be selected from Fe, at least one metal Cr, Mn, Co, Ni and Cu or the like comprising an oxide of the metal. 此外也可以是这些材料以外的颜料。 Further pigments may be other than these materials. 作为低膨胀填料，较好是使用选自二氧化硅、氧化铝、氧化锆、硅酸锆、堇青石、磷酸锆类化合物、钠钙玻璃和硼硅酸盐玻璃的至少1种材料。 As the low-expansion filler, it is preferred to use at least one material selected from silica, alumina, zirconium oxide, zirconium silicate, cordierite, a zirconium phosphate compound, soda lime glass and borosilicate glass. 作为磷酸锆类化合物，可例举（ZrO) 2P207、NaZr2 (PO4) 3、KZr2 (PO4) 3、 Caa 5Zr2 (PO4) 3、NbZr (PO4) 3、Zr2 (WO3) (PO4) 2、它们的复合化合物。 The zirconium phosphate compound may be (ZrO) 2P207, NaZr2 (PO4) 3, KZr2 (PO4) 3, Caa 5Zr2 (PO4) 3, NbZr (PO4) 3, Zr2 (WO3) (PO4) 2, their composite compound. 低膨胀填料是指具有比密封玻璃更低的热膨胀系数的填料。 Refers to a low-expansion filler having a filler of the sealing glass is lower than the coefficient of thermal expansion. 密封用玻璃材料也可以包含除激光吸收材料和低膨胀填料以外的其它填料（例如，具有与密封玻璃的热膨胀率同等或更大的热膨胀系数的填料）。  The sealing glass material may also comprise other fillers except that the laser absorbent material and other than low-expansion filler (e.g., a filler having a greater coefficient of thermal expansion of the sealing glass and the thermal expansion coefficient equal to or). 但是，通常没有必要使用其它的填料。 Generally, however, not necessary to use other fillers. 下面，只要没有特别言及，填料即表示激光吸收材料和低膨胀填料，填料的量的比例等是指激光吸收材料和低膨胀填料的总量的比例。 Hereinafter, unless otherwise described, the filler means that the laser absorbent and a low-expansion filler, the ratio of the amount of the filler and the like refers to the proportion of laser absorbing material and the total amount of the low-expansion filler. 为了使密封后的基板间隔（第一玻璃基板2与第二玻璃基板3之间的间隔）变得狭小，将密封材料层9的厚度T设为15 μ m以下、较好设为10 μ m以下。  In order to seal the gap between the substrates (the first glass substrate 2 and the interval between the second glass substrate 3) becomes narrow, the thickness T of the sealing material layer 9 to 15 μ m or less, preferably to 10 μ m or less. 密封材料层9的厚度T由电子器件1的结构决定，但实用上较好设为1 μ m以上。 The thickness of the sealing material layer T 9 is determined by the structure of the electronic device 1, but practically preferably 1 μ m or more is set. 在形成这样的厚度的密封材料层9时，要求作为填料的激光吸收材料和低膨胀填料的微粒化。 When the sealing material layer 9 is formed of such a thickness, required as a laser absorbing material and a filler of fine particles of the low-expansion filler. 具体而言，需要将填料粒子的最大粒径至少设为小于密封材料层9的厚度T。 Specifically, for the maximum particle size of the filler particles to be smaller than at least the thickness of the sealing material layer 9 is T. 现有的填料中，伴随着最大粒径的微细化，具有全部填料粒子微粒化的倾向。 Conventional fillers, along with the miniaturization of the maximum particle size, tends to all filler particles atomized. 此外，现有的密封用玻璃材料为了减小与玻璃基板2 及玻璃基板3的热膨胀系数的差，包含较大量的低膨胀填料。 In addition, conventional glass material for sealing in order to reduce the difference in thermal expansion coefficient of glass substrate 3 and the glass substrate 2, comprising a relatively large amount of low-expansion filler. 在包含较大量的这样的微粒状态的低膨胀填料的密封用玻璃材料中，由于如上所述低膨胀填料的微粒化会招致表面积的增大，所以由此导致密封用玻璃材料的流动性降低。  In the glass material for sealing contains low-expansion of a relatively large amount of such filler particulate state, since the fine particles of the low-expansion filler as described above will lead to increased surface area, thus resulting in a flow of the glass material for sealing reduced. 为了用激光将流动性低的密封用玻璃材料熔融，需要例如提高激光的输出功率而升高加工温度（加热温度）。 For a laser to a low fluidity of molten glass material for sealing, necessary to increase the laser output power is raised, for example, the processing temperature (heating temperature). 但是，使用激光将加工温度升高的情况下，容易在玻璃基板2、3或密封层8产生裂缝或破裂等。 However, when using a laser processing temperature increased, prone to cracks or breakage in the glass substrates 2 and 3 or the sealing layer 8. 于是，本实施方式中降低了添加到密封用玻璃材料中的低膨胀填料的量。  Thus, the present embodiment reduces the amount added to the low-expansion glass material for sealing the filler. 具体而言，将密封用玻璃材料中的低膨胀填料和激光吸收材料的总量设在2〜44体积％的范围内。 Specifically, the total amount of the low-expansion filler and a laser glass material for sealing the absorbent material is provided in the range of 2~44% by volume. 当降低密封用玻璃材料中的低膨胀填料的含量时，自然地经烧成的密封用玻璃材料的热膨胀系数ai与玻璃基板2、3的热膨胀系数α 2的差变大。 When reducing the low-expansion glass material for sealing in the thermal expansion of the glass material for sealing the content of the filler, naturally after sintering coefficients ai and the thermal expansion coefficient difference between the glass substrates 2 and 3 α 2 increases. 由该经烧成的密封用玻璃材料形成的密封材料层与玻璃基板2、3的热膨胀差被认为是导致玻璃基板2、3或密封层8产生裂缝或破裂等的主要原因，因此现有的密封用玻璃材料如上所述含有较大量的低膨胀填料。 Formed by the glass material for sealing by firing the sealing material layer and the thermal expansion of the glass substrates 2 and 3 is considered to be the main cause of the difference between the glass substrates 2 and 3 or the sealing layer 8 of cracks or breakage, and therefore conventional sealing containing a relatively large amount of low-expansion glass filler material as described above. 下面，将作为构成密封材料层9的材料的经烧成的密封用玻璃材料也称为密封材料。  Next, as the glass material for sealing by firing the material constituting the sealing material layer 9 is also referred to as a sealing material. 将该密封材料的热膨胀系数Ci 1也称为密封材料层的热膨胀系数αι。 The thermal expansion coefficient of the sealing Ci 1 is also referred to as thermal expansion coefficient of the sealing material layer αι. 激光密封工序中的玻璃基板2、3或密封层8的裂缝或破裂起因于伴随着密封材料层9的熔融和固化而在玻璃基板2、3上产生的残留应力。  The glass substrate of the laser sealing process of the sealing layer 3 or cracks or breakage due to the sealing material layer accompanying melting and solidification 9 generated on the glass substrates 2 and 8 of residual stress. 在密封材料的热膨胀系数ai大于玻璃基板2、3的热膨胀系数Ci2的情况下，由于激光密封工序（加热和冷却工序）中的密封材料层9的收缩量比玻璃基板2、3的收缩量更大，所以在玻璃基板2、3上产生较强的压缩应力（残留应力）。 The thermal expansion coefficient of the thermal expansion coefficient of the sealing material is greater than the glass substrates 2 and 3 ai Ci2 case, since the amount of shrinkage than the shrinkage of the glass substrate, a sealing material layer by laser sealing step (heating and cooling step) 9 2 and 3 more large, strong compressive stress is generated (residual stress) on the glass substrates 2 and 3. 在玻璃基板2、3上产生的残留应力通过下式求出。 By the equation residual stress generated in the glass substrates 2 and 3. 上式（1)中，α为密封材料的热膨胀系数Ci1和玻璃基板2、3的热膨胀系数α 2 的差，ΛT为激光密封时的温度差（从密封材料层9的熔融温度（加工温度）到被冷却至常温附近为止的温度差）被冷却时间除而得的值，E为密封材料或玻璃基板2、3的杨氏模量，V为泊松比。  formula (1), [alpha] is the thermal expansion coefficient of the sealing material Ci1 and the thermal expansion coefficient of the glass substrates 2 and 3 [alpha] difference 2, the temperature difference during ΛT laser sealing (the sealing material layer melting temperature 9 ( processing temperature) to be cooled to a temperature around room temperature until the difference) is divided by the value obtained by cooling time, E is Young's modulus of the sealing material or glass substrates 2 and 3, V is Poisson's ratio. 激光密封时，由于如果激光的扫描速度和斑点直径固定则冷却时间也几乎固定，所以ΛΤ实质上成为激光密封时的温度差。 When the laser sealing, because if the spot diameter and the scanning speed of the cooling time of the laser is fixed almost fixed, the temperature difference becomes substantially ΛΤ during laser sealing. 对于现有的密封用玻璃材料，主要采用使激光密封工序后的材料的式（1)的α变小从而降低残留应力的技术。  For a conventional glass material for sealing, mainly α becomes small formula laser sealing material after the step (1) thereby reducing the residual stress in the art. 对于这方面，当将密封材料层9的厚度T变薄为15 μ m以下、 较好为IOym以下时，可知ΛΤ的值将产生较大影响。 In this regard, when the thickness of the sealing material layer thinner T 9 is 15 μ m or less, preferably less IOym, ΛΤ values ​​found will have a greater impact. 即，为了提高密封材料的流动性，如果提高激光加工温度（加热温度），则残留应力α的增大将变得显著。 That is, in order to improve the flowability of the sealing material, if raising the temperature of the laser processing (heating temperature), the residual stress becomes α increased significantly. 图7表示使用厚度T为15 μ m以下的薄密封材料层9时经激光密封的玻璃基板的变形量和激光加工温度（加热温度）之间的关系的一例。  FIG. 7 shows an example of the relationship of a thickness T of the sealing material between the thin layer of 15 μ m or less 9:00 by laser sealing and deformation of the laser processing temperature (heating temperature) of the glass substrate. 从图7可知，随着激光加工温度的上升玻璃基板的变形量逐渐增加，由此可知，激光密封工序（加热和冷却工序）后的玻璃基板的残留应力增大了。 Seen from FIG. 7, the laser processing as the deformation temperature rise of the glass substrate is gradually increased, can be seen, the residual stress in the glass substrate after the laser sealing step (step of heating and cooling) is increased. 另一方面，当将密封材料层9的厚度T变薄为15 μ m以下时，密封材料层9的收缩量的影响减小，因此，与密封材料层9的厚度T较厚时相比，基于玻璃基板2、3与密封材料层9的收缩量的差（热膨胀差）的应力变小。 On the other hand, when the thickness of the sealing material layer thinner T 9 is 15 μ m or less, the influence of shrinkage of the sealing material layer 9 is reduced, and therefore, as compared with the thickness T of the sealing material layer 9 is thick, stress difference based on the amount of shrinkage of the glass substrates 2 and 3 and the sealing material layer 9 (thermal expansion difference) becomes smaller. 这样，使用厚度T为15 μ m以下的薄密封材料层9时，与降低密封材料层9与玻璃基板2、3的热膨胀差相比，抑制激光加工温度的上升变得更为重要。  Thus, a thin thickness T of the sealing material layer 15 μ m or less in 0900, and the sealing material layer 9 and reduce the thermal expansion difference between the glass substrates 2 and 3 compared to suppress an increase in temperature of the laser processing becomes more important . 当密封材料层9的厚度T为10 μ m以下时，变得更为显著。 When the sealing material layer thickness T 9 is 10 μ m or less, it becomes more pronounced. 于是，对于本实施方式，为实现激光加工温度的降低， 将密封用玻璃材料中的低膨胀填料和激光吸收材料的总量（填料的含量）设在2〜44体积％的范围内。 Thus, with the present embodiment, the laser processing to achieve a reduction in temperature, the low-expansion filler and a laser glass material for sealing in the total amount of absorbent material (filler content) is set in the range of 2~44% by volume. 不仅低膨胀填料，激光吸收材料也影响密封材料的流动性。  Not only the low-expansion filler, laser light absorbing material also affect the flowability of the sealing material. 因此，本实施方式将密封用玻璃材料中的低膨胀填料和激光吸收材料的总量设为44体积％以下。 Accordingly, the present embodiment will total low-expansion filler and a laser glass material for sealing the absorbent material to 44 vol%. 如果低膨胀填料和激光吸收材料的总量为44体积％以下，则能够充分获得激光加工温度（加热温度）降低的效果。 If the total amount of the low-expansion filler and a laser absorbent material is 44 vol% or less, it is possible to sufficiently obtain the laser processing temperature (heating temperature) to reduce the effect. 在降低了低膨胀填料和激光吸收材料的总量的情况下，特别是受到因降低了低膨胀填料的含量而产生的影响，密封材料层9与玻璃基板2、3的热膨胀差虽然变大，可是由于抑制了密封材料的流动性的降低，所以能够使激光加工温度（加热温度）变低。  In the case of reducing the low-expansion filler and the total amount of laser absorbing material, especially affected due to a decrease of the content of the low-expansion filler is generated, the sealing material layer 9 and the thermal expansion of the glass substrates 2 and 3, although the difference becomes large, but due to suppression of decrease in flowability of the sealing material, it is possible to make the laser processing temperature (heating temperature) becomes lower. 由此，降低了激光密封后的玻璃基板2、3的残留应力，因此可以抑制在玻璃基板2、3或密封层8产生裂缝或破裂等。 This reduces the residual stress of the glass substrates 2 and 3 after the laser sealing, it is possible to suppress the generation of cracks or breakage in the glass substrates 2 and 3 or the sealing layer 8 and the like. 激光吸收材料是在实施激光密封工序时所必需的成分，相对于密封用玻璃材料其含量较好设在2〜10体积％的范围内。  laser absorbing material at the time of laser sealing process embodiment component necessary, with respect to the glass material for sealing is preferably provided in an amount in the range of 2~10% by volume. 如果激光吸收材料的含量不足2体积％，则有可能照射激光时无法使密封材料层9充分熔融。 If the content of the laser absorbent is less than 2% by volume, it may be impossible to make the sealing material layer 9 sufficiently melted when laser is irradiated. 这将成为导致粘接不良的原因。 This will be the cause of poor bonding. 另一方面，如果激光吸收材料的含量超过10体积％，则可能会发生照射激光时在与第二玻璃基板3的界面附近局部地发热而使第二玻璃基板3出现破裂、或者密封用玻璃材料的熔融时的流动性劣化而出现与第一玻璃基板2的粘接性下降的情况。 On the other hand, if the content of the laser absorbent material exceeds 10 vol%, the laser irradiation may occur in the vicinity of the interface locally heating the second glass substrate 3 of the second glass substrate 3 rupture, or the glass material for sealing deterioration of the fluidity of the melt and decrease the adhesion to the case of the first glass substrate 2 occurs. 为了降低密封材料层9与玻璃基板2、3之间的热膨胀差，较好是含有低膨胀填料， 但在具有可应用于厚度T为15 μ m以下的薄密封材料层9的粒径的情况下，将成为导致激光加工时的流动性下降的主要原因，因此较好是降低其含量。  In order to reduce the thermal expansion of the sealing material layer 9 between the glass substrates 2 and the differential, preferably comprising a low-expansion filler, but may be applied with a thin thickness T of the sealing material layer of 15 μ m or less in grain 9 the diameter, the flowability will become the leading cause of decreased time of laser processing, and accordingly it is preferred to reduce the content thereof. 因此，相对于密封用玻璃材料，低膨胀填料的含量较好设为40体积％以下。 Thus, with respect to the glass material for sealing, the content of low-expansion filler is preferably set to 40% by volume or less. 如果低膨胀填料的含量超过40体积％，则难以避免激光加工温度的上升。 If the content of the low-expansion filler exceeds 40 vol%, it is difficult to avoid the increase in temperature of the laser processing. 实用上来讲，密封用玻璃材料较好在10体积％以上的范围内含有低膨胀填料，但也可以如下所述根据情况不含有低膨胀填料。 In terms of the practical use, the glass material for sealing is preferably in the range of 10 vol% contains low-expansion filler, it is also possible according to the circumstances as containing no low-expansion filler. 本实施方式的密封材料为了降低低膨胀填料的含量，将密封材料层9的热膨胀系数h与玻璃基板2、3的热膨胀系数Ci 2之间的差变大。  The sealing material of the present embodiment in order to reduce the content of low-expansion filler, the difference between the thermal expansion coefficient h and the coefficient of thermal expansion of the glass substrates 2 and 3 Ci of the sealing material layer 9 becomes larger. 具体而言，将密封材料层9与玻璃基板2、3之间的热膨胀差设在15〜65(X1(T7/°C)的范围内。换言之，如果热膨胀差在15〜65 (X 1(T7/°C )的范围内，则通过降低低膨胀填料的含量来维持密封材料的流动性，并基于此来降低激光加工温度（加热温度），从而可以抑制在玻璃基板2、3或密封层8产生裂缝或破裂等。 Specifically, the thermal expansion between the sealing material layer 9 and the glass substrates 2 and 3 provided in the difference (range X1 (T7 / ° C) of 15~65. In other words, if the difference in thermal expansion 15~65 (X 1 ( the T7 / ° C) range, is maintained by reducing the content of the low-expansion filler flowability of the sealing material, and the laser processing based on this reduced temperature (heating temperature), the glass substrates 2 and 3 can be suppressed in the sealing layer or 8 generates cracks or breakage. 这里，密封材料层9的热膨胀系数ai及玻璃基板2、3的热膨胀系数α 2表示使用押棒式热膨胀系数测定装置测得的值，测定热膨胀系数ai、Ci2的温度范围设为50〜 250°C。  Here, the thermal expansion coefficient of the thermal expansion coefficient of the sealing layer 9 of ai and the glass substrates 2 and 3 α 2 represents the use of charge bar thermal expansion coefficient value means the measured measurement of thermal expansion coefficient ai, Ci2 and temperature range to 50~ 250 ° C. 此外，密封材料层9与玻璃基板2、3的热膨胀差是表示从其中一个较大的值减去较小的值而得的值（（Ci 1-Ci2)或者（Ci2-Ci1)),密封材料层9的热膨胀系数Ci 1与玻璃基板2、3的热膨胀系数Ci2之间的大小关系为无论谁大谁小都可以。 Further, the sealing material layer 9 and the difference in the thermal expansion of the glass substrates 2 and 3 is a larger value from which is subtracted the value of ((Ci 1-Ci2) or (Ci2-Ci1)) obtained by a smaller value, the seal 1 and the magnitude relation between the thermal expansion coefficient of the glass substrates 2 and 3 Ci2 thermal expansion coefficient Ci layer 9 is small regardless of who who are large. 密封材料层9与玻璃基板2、3的热膨胀差小于15X 1(T7/°C意味着密封材料含有较大量的低膨胀填料，因此难以避免上述的激光加工温度的上升。如果密封材料层9与玻璃基板2、3的热膨胀差超过65 X 1(T/°C，则受到激光加工温度的影响，玻璃基板2、3与密封材料层9的收缩量的差的影响变大，因此，即使降低激光加工温度也容易产生玻璃基板2、3 或密封层8的裂缝或破裂等。  The sealing material layer 9 and the thermal expansion of the glass substrates 2 and 3 is less than 15X 1 (T7 / ° C means that the sealing material contains a relatively large amount of low-expansion filler, it is difficult to avoid the temperature rise of the laser processing. If the sealing material layer 9 and the difference in thermal expansion glass substrates 2 and 3 is more than 65 X 1 (T / ° C, the temperature is affected by the laser processing, the influence amount of shrinkage of the glass substrates 2 and the sealing material layer 9 difference becomes large, even reducing the laser processing temperature or the glass substrates 2 and prone to the sealing layer 8 of cracks or breakage. 这样，如果密封材料层9与玻璃基板2、3的热膨胀差在65 X KT7/°C以下的范围内， 则能够降低密封材料中的低膨胀填料的含量。  Thus, if the sealing material layer 9 and the thermal expansion between the glass substrates 2 and 3 in the range of 65 X KT7 / ° C or less, it is possible to reduce the low-expansion filler in the sealing material content. 还有，即使在密封材料不包含低膨胀填料的情况下，如果密封材料层9与玻璃基板2、3的热膨胀差为65 X 1(T7/°C以下，则也能抑制在玻璃基板2、3或密封层8产生裂缝或破裂等。密封材料只要至少包含激光吸收材料作为填料即可，低膨胀填料的含量为零也可。因此，密封用玻璃材料中的低膨胀填料和激光吸收材料的总量只要是作为激光吸收材料的含量的下限值的2体积％以上即可。 Further, even in the case where the sealing material does not contain a low-expansion filler, if the sealing material layer 9 and the difference in the thermal expansion of the glass substrates 2 and 3 is 65 X 1 (T7 / ° C or less, it can be suppressed in the glass substrate 2, 3 or the sealing layer 8 generates cracks or breakage sealing material comprises at least as long as the filler can be laser absorbent, low-expansion filler content may also be zero. Thus, the low-expansion filler and a laser glass material for sealing the absorbent material as long as the total amount of laser light is more than 2% of the lower limit of the volume content of the material can absorb. 但是，在降低激光密封时的玻璃基板2、3与密封玻璃材9的收缩量的差的方面，较好将密封玻璃材9与玻璃基板2、3的热膨胀差设为50 X 1(T/°C以下，更好设为35 X 1(T7/°C 以下。从这样的角度考虑，密封用玻璃材料较好在10体积％以上的范围内含有低膨胀填料。由将在2〜10体积％的范围内含有激光吸收材料并且在10〜40体积％的范围内含有低膨胀填料的密封用玻璃材料烧成而获得的密封材料，能够在降低激光密封时的玻璃基板2、3与密封材料层9的收缩量的差的同时，使激光加工温度下降，因此有助于提高密封性的可靠性。  However, aspects of the difference in the shrinkage amount of the glass substrate decreases laser sealing member 3 and the sealing glass 9, the glass sealing member 9 is preferably the thermal expansion difference between the glass substrates 2 and 3 to 50 X 1 (T / ° C or less, more preferably to 35 X 1 (T7 / ° C or less. from this viewpoint, the glass material for sealing is preferably in the range of more than 10% by volume of a low-expansion filler. 2 will be the in the range of ~ 10% by volume of the laser absorbent material and glass material for sealing contains low-expansion filler obtained by firing the sealing material is in a range of 10 ~ 40% by volume, the glass substrates 2 can be reduced when the laser sealing while the difference between the amount of shrinkage of the sealing material layer 9, the laser processing temperature decrease, thus contributing to improve the reliability of sealing. 密封材料的流动性以及基于此设定的激光加工温度不仅受到密封材料中的填料(激光吸收材料和低膨胀填料）的含量的影响，还受到填料的粒子形状的影响。  The fluidity and the setting temperature of the laser-based sealing material is affected not only by the content of the filler of the sealing material (laser absorbent and a low-expansion filler), also affected by the particle shape of the filler. 如上所述， 需要至少将填料粒子的最大粒径设为小于密封材料层9的厚度T。 As described above, at least the maximum diameter of the filler particles is smaller than the thickness of the sealing material layer 9 is T. 此外，较好是减少填料粒子的比表面积。 Further, it is preferred to reduce the specific surface area of ​​the filler particles. 具体而言，密封用玻璃材料内的填料的表面积较好在0. 5〜6m2/cm3的范围内。 Specifically, the surface area of ​​the filler in the glass material for sealing is preferably in the range of 0. 5~6m2 / cm3 of. 密封用玻璃材料内的填料的表面积是指由[(填料的比表面积）X (填料的比重）X (填料的含量（体积％ ))]表示的值。 Surface area filler in the glass material for sealing is defined by [(specific surface area of ​​the filler) X-(packing specific gravity) X-(filler content (vol%))] represented by the value. 例如，在包含激光吸收材料和低膨胀填料的密封用玻璃材料中，密封用玻璃材料中的它们的总表面积由[(激光吸收剂的比表面积）X (激光吸收剂的比重）X (激光吸收剂的含量（体积％ )) +(低膨胀填料的比表面积）X (低膨胀填料的比重）X (低膨胀填料的含量（体积％ ))]求出。 For example, the glass material for sealing containing a laser absorbent and a low-expansion filler, a glass sealing material by the total surface area thereof [(specific surface area of ​​the laser absorbent) X-(laser absorbent gravity) X-(laser absorbing agent content (vol%)) + (low-expansion filler specific surface area) X-(low-expansion filler gravity) X-(low-expansion filler content (vol%))] is obtained. 通过将密封用玻璃材料内的填料的表面积设为0. 5〜6m2/cm3的范围内，能够更加提高密封材料的流动性，进一步使激光加工温度下降。  By filler in the glass material for sealing to a surface area in the range of 0. 5~6m2 / cm3 can be further improved flowability of the sealing material, the laser processing temperature drops further. 通过控制低膨胀填料和激光吸收材料的粒度分布能够实现上述的填料粒子的表面积。 Particle size distribution of the absorbent material by controlling the low-expansion filler and a laser can be realized in the surface area of ​​the filler particles. 具体而言，能够通过在制备低膨胀填料和激光吸收材料时利用筛子或风力分离等将各粉末进行分级而获得。 Specifically, it can be obtained by using a sieve or wind separation in the preparation of the low-expansion filler and a laser absorbent material in each powder was classified. 上述的实施方式的电子器件1例如可以按照以下方法来制造。  The electronic device 1 of the above embodiment can be produced, for example, by the following method. 首先，如图5及图6所示，在第二玻璃基板3的密封区域7上形成密封材料层9。 First, as shown in FIG. 5 and FIG. 6, the sealing material layer 9 is formed on the sealing region 7 of the second glass substrate 3. 在形成密封材料层9时，首先制备密封用玻璃材料，使低膨胀填料和激光吸收材料的总量在2〜44体积％的范围内， 并基于此来形成与玻璃基板2、3的热膨胀差在15〜65X 1(T7/°C的范围内的密封材料层。 The total amount of thermal expansion is formed in 0900 first prepared sealing glass material for sealing material layer, the low-expansion filler and a laser absorbent material is in the range of 2~44% by volume, based on which the glass substrates 2 and 3 to form a difference a sealing material layer is in the range (T7 / ° C of the 15~65X 1. 如上所述，密封用玻璃材料由包含密封玻璃、激光吸收材料和任选的低膨胀填料以及根据需要包含除这些以外的添加材料的组合物形成。  As described above, the glass material for sealing comprises sealing glass, low-expansion filler and a laser absorbent and optionally formed from a composition according to need to include additional materials other than these are. 本发明中，将添加材料中的在烧成时通过挥发和烧去而从组合物消失的溶剂和粘合剂从密封玻璃材料的构成成分中除去。 In the present invention, the added material is removed from the composition disappeared from the solvent and binder component constituting the glass sealing material by volatilization and burn off during firing. 烧成时通过挥发和烧去而从组合物消失的成分是为了通过涂布等在玻璃基板表面形成密封用玻璃材料的层而通常必需的添加物。 Disappears from the composition components to form a layer by coating or the like in the glass material for sealing the glass substrate surface is generally necessary additive by volatilization during firing and burning off. 可是，该消失的成分由于不是构成密封材料的成分，所以不是上述密封用玻璃材料的构成成分，而上述构成成分的组成比例是指将该消失的成分除去了的构成比例。 However, this is not due to the disappearance of a component constituting the component sealing material, the sealing is not the above-described composition ratio of the constituent components of the glass material, and the composition ratio of the constituent components refers to the disappearance of a component removed. 下面，将包含密封用玻璃材料的构成成分和消失的成分诸如溶剂和粘合剂等、用于在烧成后形成为密封材料的层的组合物称为密封材料糊料。 The following components, including the constituents of the glass material for sealing and the disappearance of such a solvent and a binder and the like, for forming the sealing material layer after firing compositions as sealing material paste. 通过烧成而烧去的成分的组成比例在考虑烧成后剩余的成分的组成比例和密封材料糊料所要求的涂布性等特性后来确定。  The composition ratio by firing the composition ratio of the component to burn after considering the remaining ingredients and baking the sealing material paste applied to the desired properties such as determined later. 密封材料糊料通过混合密封用玻璃材料的各构成成分和载体来制备。  The sealing material paste was prepared by mixing each component and the carrier for sealing the glass material. 载体是将作为粘合剂成分的树脂溶解在溶剂中而得。 The carrier is obtained by dissolving in a solvent a resin binder component. 作为载体用的树脂，可使用例如甲基纤维素、乙基纤维素、羧甲基纤维素、乙氧基纤维素、苄基纤维素、丙基纤维素、硝基纤维素等纤维素类树月旨，甲基丙烯酸甲酯、甲基丙烯酸乙酯、甲基丙烯酸丁酯、甲基丙烯酸-2-羟基乙酯、丙烯酸丁酯、丙烯酸-2-羟基乙酯等丙烯酸类单体的1种以上聚合而得到的丙烯酸类树脂等有机树脂。 As the resin used in the carrier, may be used such as methyl cellulose, ethyl cellulose, carboxymethyl cellulose, ethoxylated cellulose, benzyl cellulose, propyl cellulose, nitrocellulose and other cellulose-based tree one kind of purpose month, methyl methacrylate, methyl methacrylate, ethyl methacrylate, butyl methacrylate, 2-hydroxy ethyl acrylate, butyl acrylate, 2-hydroxyethyl methacrylate monomer above obtained by polymerizing an organic resin such as acrylic resin. 作为溶剂，在载体用树脂为纤维素类树脂时可以使用萜品醇、丁基卡必醇乙酸酯、乙基卡必醇乙酸酯等溶剂，在载体用树脂为丙烯酸类树脂时可以使用甲基乙基酮、萜品醇、丁基卡必醇乙酸酯、乙基卡必醇乙酸酯等溶剂。 Can be used as a solvent, the resin in the carrier is a cellulose-based resin may be used as terpineol, butyl carbitol acetate, ethyl carbitol acetate solvent, a carrier resin is an acrylic resin methyl ethyl ketone, terpineol, butyl carbitol acetate, ethyl carbitol acetate solvent. 密封材料糊料的粘度只要与适应于将其涂布于玻璃基板3的装置的粘度一致即可，可通过树脂（粘合剂成分）与溶剂的比例或者密封用玻璃材料的成分与载体的比例来调整。  The viscosity of the sealing material paste as long as it is adapted to the viscosity of the coating apparatus can be uniform in a glass substrate 3, by the ratio of the resin component (binder component) to the solvent or the glass material for sealing and the ratio of the carrier is adjusted. 密封材料糊料中可以添加如消泡剂和分散剂等在玻璃糊料领域中公知的添加物。 The sealing material paste may be added as a defoaming agent and a dispersing agent in the glass paste additives known in the art. 这些添加物也是在通常烧成时消失的成分。 These additives are also usually disappear when fired component. 密封材料糊料的制备可采用使用具备搅拌叶片的旋转式混合机或辊式粉碎机、球磨机等的公知的方法。 It may be prepared using a known method using the sealing material paste equipped with a stirring blade rotary mixer or a roll mill, a ball mill or the like. 在第二玻璃基板3的密封区域7涂布上述密封材料糊料，使其干燥而形成密封材料糊料的涂布层。  In applying the sealing material paste 7 the sealing region of the second glass substrate 3, and dried to form a coating layer of the sealing material paste. 涂布密封材料糊料使得烧成后的膜厚达到15 μ m以下。 Applying sealing material paste so that the film thickness after firing would be 15 μ m or less. 密封材料糊料采用例如丝网印刷或凹版印刷等印刷法涂布在第二密封区域7,或者使用分配器等沿着第二密封区域7进行涂布。 The sealing material paste, for example, using a coating such as screen printing or gravure printing method in a second sealing region 7, using a dispenser or the like is applied along the second sealing region 7. 密封材料糊料的涂布层较好在例如120°C以上的温度下干燥10分钟以上。 Coating the sealing material paste layer is preferably dried for example at temperatures above 120 ° C over 10 minutes. 干燥工序是为了除去涂布层内的溶剂而实施的工序。 The drying step is a step for removing the solvent in the coating layer of the embodiment. 如果涂布层内残留有溶剂，则之后的烧成工序中可能会无法充分除去粘合剂等应消失的成分。 If there is residual solvent in the coating layer, the subsequent firing step may not sufficiently remove the binder and other ingredients should disappear. 接着，将上述的密封材料糊料的涂布层烧成而形成密封材料层9。  Next, the above-mentioned sealing material paste layer is fired to form a coating layer of a sealing material 9. 烧成工序如下： 先将涂布层加热至密封玻璃（玻璃料）的玻璃化温度以下的温度，将涂布层内的粘合剂成分等除去后加热至密封玻璃（玻璃料）的软化点以上的温度，将密封用玻璃材料熔融并使其烧结附着于玻璃基板3。 Firing step as follows: first coating layer is heated to a temperature of the sealing glass (glass frit) is the glass transition temperature of the binder component after the heat was removed and the like in the coating layer to the sealing glass (glass frit) softening point temperatures above the glass sealing material is melted and allowed to adhere to the glass substrate 3 sinter. 由此，在第二玻璃基板3的密封区域7由将密封用玻璃材料烧成而得的材料（密封材料）形成密封材料层9。 Thus, the sealing region 7 of the second glass substrate 3 formed of the sealing material layer 9 will be obtained by firing a glass material for sealing material (sealing material). 接着，在第二玻璃基板3之外，准备另外制造的第一玻璃基板2,使用这些玻璃基板2、3来制造OELD、TOP、IXD等FPD、使用OEL元件的照明装置、染料敏化型太阳能电池之类的太阳能电池等电子器件1。  Next, in addition to the second glass substrate 3, further preparing a first glass substrate 2 is manufactured using the glass substrates 2 and 3 is manufactured OELD, TOP, IXD the FPD and the like, the lighting apparatus using an OEL element, a dye-sensitized solar cell or the like electronic device such as a solar cell. 即，如图2 (b)所示，隔着密封材料层9层叠第一玻璃基板2 和第二玻璃基板3,使得第一玻璃基板2和第二玻璃基板3的表面2a、3a彼此相向。 That is, in FIG. 2 (b), the sealing material layer 9 laminated via a first glass substrate 2 and the second glass substrate 3, so that the first glass substrate 2 and the second surface. 2A glass substrate 3, 3a towards each other. 基于密封材料层9的厚度而在第一玻璃基板2和第二玻璃基板3之间形成间隙。 A gap is formed between the first glass substrate 2 and the second glass substrate 3 based on the thickness of the sealing material layer 9. 接着，如图2(c)所示，透过第二玻璃基板3对密封材料层9照射激光10。  Next, FIG. 2 (c), the second laser beam is irradiated through the nine three pairs of sealing material layer of the glass substrate 10. 另外， 激光10也可透过第一玻璃基板2对密封材料层9照射。 Further, the laser 10 may be irradiated with the first glass substrate 2 through the sealing material layer 9. 激光10沿着框状的密封材料层9 一边扫描一边照射。 Laser 10 along the frame-shaped sealing material layer 9 is irradiated while being scanned. 然后，通过对密封材料层9的整周照射激光10,从而如图2(d)所示形成将第一玻璃基板2和第二玻璃基板3之间密封的密封层8。 Thereafter, the entire circumference of the sealing material layer is irradiated with laser light 109 so formed as to seal between the first glass substrate 2 and the sealing layer of the second glass substrate 82 as shown in (d). 密封层8的厚度虽然相较于密封材料层9的厚度有时减少，但由于密封材料层9的厚度较薄为15 μ m以下，因此，激光密封后的膜厚减少很小。 Although the thickness of the sealing layer of thickness 8 compared to the sealing material layer 9 is sometimes reduced, but since the thickness of the sealing material layer 9 is thin as 15 μ m or less, thus reducing the film thickness after the laser sealing is small. 因此，密封层8具有与密封材料层9的厚度近似的厚度（15μπι以下）。 Thus, the sealing layer 8 having a thickness of sealing material layer with a thickness of approximately 9 (15μπι hereinafter). 由此，利用由第一玻璃基板2、第二玻璃基板3和密封层8构成的玻璃面板来制造将设置在第一玻璃基板2和第二玻璃基板3之间的电子兀件部4气密密封的电子器件1。  Thus, with the first glass substrate 2, the glass panel 3 and a second glass substrate constituting the sealing layer 8 of the manufactured glass substrate disposed on a first portion between the electronic Wu member 2 and the second glass substrate 3 4 hermetically sealed electronic device 1. 另外，本实施方式的玻璃面板不限于电子器件1的构成零部件，也可应用于电子零部件的密封体或多层玻璃之类的玻璃构件（建材等）。 Further, the glass panel of the present embodiment is not limited to the components constituting the electronic device 1, the sealing member may be applied to the glass body of the electronic components or the like or a multilayer glass (building materials). 对激光10没有特别限定，可使用来自半导体激光器、二氧化碳激光器、准分子激光器、YAG激光器、HeNe激光器等的激光。  The laser 10 is not particularly limited, from the semiconductor laser may be a laser, a carbon dioxide laser, excimer laser, YAG laser, a HeNe laser or the like. 激光10的输出功率根据密封材料层9的厚度等适当设定，例如较好是设在2〜150W的范围内。 10 the laser output power is appropriately set according to the thickness of the sealing material layer 9, for example, is preferably set in the range of 2~150W. 如果激光输出功率低于2W，则可能无法使密封材料层9熔融，而如果高于150W，则玻璃基板2、3容易产生裂缝或破裂等。 If the laser output power is less than 2W, may not melt the sealing material layer 9, whereas if it exceeds 150W, the glass substrates 2 and 3 likely to cracks or breakage. 激光10的输出功率更好是在5〜100W的范围内。 Output of the laser 10 is preferably in the range of 5~100W. 根据本实施方式的电子器件1及其制造工序，即使在将密封材料层9的厚度T变薄为15 μ m以下而使基板间隔变得狭小的情况下，由于能够降低激光密封时的玻璃基板2、 3的残留应力，所以也可以抑制在玻璃基板2、3或密封层8产生裂缝或破裂等。  The electronic device 1 according to the present embodiment and a manufacturing process, even in a case where the thickness T of the sealing material layer thinner 9 is 15 μ m or less so that the substrate gap becomes narrow, since the laser can be reduced when the seal 2, the residual stress of the glass substrate 3, it can suppress the generation of cracks or breakage in the glass substrates 2 and 3 or the sealing layer 8. 因而，能够以高成品率制造将玻璃封装薄型化的电子器件1，同时还可以提高电子器件1的密封性、气密密封性以及它们的可靠性。 Accordingly, it is possible to manufacture a glass encapsulated thin electronic device 1 with a high yield, but also can improve the sealing, hermetic sealing of the electronic device 1 and their reliability. 然而，上述实施方式中主要对第一玻璃基板2和第二玻璃基板3的热膨胀系数CI2 中任一个与密封材料层9的热膨胀系数ai的差都在15〜65 (X 1(T7/°C )的范围内的情况进行了说明，但玻璃基板2、3的构成并不限定于此。只要第一玻璃基板2的热膨胀系数α 21 和第二玻璃基板3的热膨胀系数α 22中至少一方的热膨胀系数与密封材料层9的热膨胀系数ai的差在15〜65(X1(T7/°C )的范围内，就能够获得基于密封材料中填料量的减少而产生的流动性提高的效果以及因激光加工温度的下降而产生的残留应力降低的效果，即能够获得抑制在玻璃基板2、3或密封层8产生裂缝或破裂等的效果。  However, the above-described first embodiment, mainly the second glass substrate 2 and the thermal expansion coefficient of glass substrate 3 ai CI2 any one of the coefficient of thermal expansion of the sealing material layer 9 difference in 15~65 (X 1 (T7 situation in / ° C) range has been described, but the glass substrates 2 and 3 is not limited to this configuration as long as the thermal expansion coefficient of the first glass substrate 2 α 21 and the second glass substrate 3 in the thermal expansion coefficient α 22 of at least a coefficient of thermal expansion of one of the sealing material layer of thermal expansion of 9 coefficients ai difference of 15~65 (the range X1 (T7 / ° C), it is possible to obtain a fluidity improver based on reducing the sealing material filler in the amount of generated effect and the effect of reducing the residual stress due to the temperature drop generated by the laser processing, i.e., to obtain the effect of suppressing generation of cracks or breakage in the glass substrates 2 and 3 or the sealing layer 8. 在第一玻璃基板2和第二玻璃基板3由同一种类的玻璃材料形成的情况下，自然地第一玻璃基板2的热膨胀系数α 21和第二玻璃基板3的热膨胀系数α 22中任一个与密封材料层9的热膨胀系数ai的差都在15〜65 X 1(T7/°C的范围内。在此情况下，在用激光10的热将密封材料层9熔融固着于第一玻璃基板2的工序（利用激光10的密封材料层9的熔融固着工序）中，基于因激光加工温度的下降等而产生的残留应力降低的效果，能够提高第一玻璃基板2和第二玻璃基板3与密封层8的粘接性和其可靠性。  In the case of forming the same kind of a glass material of the first glass substrate 2 and the second glass substrate 3, a thermal expansion coefficient of the first glass substrate 2 is naturally a thermal expansion coefficient [alpha] 21 and a second glass substrate 3 in α 22 and a sealing material layer according to any thermal expansion coefficient ai 9 are within the scope of the difference (T7 / ° C of 15~65 X 1. in this case, the heat of the laser 10 with the sealing material layer 9 to the first melt-bonding step 2 glass substrate (using laser melting the sealing material layer 10 of the fixing step 9), based on the residual stress due to temperature drop or the like of the laser processing arising from reduction effect can be improved first glass substrate 2 and the second glass substrate 3 and the adhesion layer 8 and the sealing reliability. 在第一玻璃基板2和第二玻璃基板3由不同种类的玻璃材料形成的情况下，只要第一玻璃基板2的热膨胀系数α 21和第二玻璃基板3的热膨胀系数α 22中任一方的热膨胀系数与密封材料层9的热膨胀系数ai的差在15〜65 (X 1(T/°C )的范围内即可，而另一方的热膨胀系数与密封材料层9的热膨胀系数α 1的差可低于15X1(T7/°C。即，在使用由不同种类的玻璃材料形成的玻璃基板2、3时，只要与密封材料层9的热膨胀差较大的玻璃基板的热膨胀系数与密封材料层9的热膨胀系数Ci 1的差在15〜65(X1(T7/°C)的范围内即可。  In the case formed by the different types of glass material of the first glass substrate 2 and the second glass substrate 3, as long as the thermal expansion coefficient of the first glass substrate 2, α 21 and a thermal expansion coefficient of the second glass substrate 3 of any [alpha] 22 thermal expansion coefficient of the thermal expansion coefficient of one of the sealing material layer 9 ai difference of 15~65 (X 1 (T / ° C) in the range can, while the thermal expansion coefficient of the thermal expansion coefficient of the other of the sealing material layer 9 α 1 the difference may be less than 15X1 (T7 / ° C. That is, when using glass substrates 2 and 3 are formed of different kinds of glass materials, so long as the thermal expansion coefficient and the thermal expansion of the sealing material layer 9 is a large difference of the glass substrate and the sealing difference in thermal expansion coefficient of the material of layer 9 can be in Ci 1 (range X1 (T7 / ° C) of 15~65. 例如，在第一玻璃基板2的热膨胀系数α 21和密封材料层9的热膨胀系数α 1的差在15〜65 (X 1(T/°C )的范围内，而形成密封材料层9的第二玻璃基板3的热膨胀系数α 22与密封材料层9的热膨胀系数ai的差低于15 X 1(T7/°C的情况下，在使用激光10的密封材料层9的熔融固着工序中，基于因激光加工温度的下降等而产生的残留应力降低的效果，可提高第一玻璃基板2与密封层8的粘接性和其可靠性。除因激光加工温度的下降等产生的残留应力降低的效果之外，还基于第二玻璃基板3与密封用玻璃材料的较小的热膨胀差从而进一步提高第二玻璃基板2与密封层8的粘接性和其可靠性。在第一玻璃基板2 的热膨胀系数α 21和第二玻璃基板3的热膨胀系数α 22相反的情况下也一样。  For example, the thermal expansion coefficient [alpha] 21 and the sealing material layer 9 in the thermal expansion coefficient of the first glass substrate 2, [alpha] 1 is in 15~65 the difference (X 1 (T / ° C) range, to form a sealing material layer the thermal expansion coefficient of the second glass substrate 9 3 α 22 and the thermal expansion coefficient of the sealing layer 9 ai difference is less than 15 X 1 (T7 / ° C, the melted sealing material layer using a laser 10 9 fixing step based on the residual stress due to the temperature drop of the laser processing and the like to produce the effect of reduction can be increased first glass substrate 2 and the adhesive layer 8 and the sealing reliability. the residue due to decreased temperature of the laser processing and the like in addition to generating other than stress-reducing effect is further based on the second glass substrate 3 and the small thermal expansion difference between the glass material for sealing thereby further improving adhesion and reliability of the second glass substrate 2 and the sealing layer 8. in a first glass the thermal expansion coefficient α 2 of the substrate 21 and the thermal expansion coefficient of the second glass substrate 3 α 22 opposite case, too. 接着，对本发明的具体实施例及其评价结果进行描述。  Next, Examples and evaluation results of specific embodiments of the present invention will be described. 另外，以下的说明不对本发明进行限定，能以符合本发明的技术思想的形式进行改变。 In the following description does not limit the invention can be modified in the form of technical idea consistent with the present invention. 准备具有83质量％的扮203、5质量％的B2O 3Ul质量％的ZnOU质量％的Al2O3 的组成且平均粒径为1. 〇μ m的铋类玻璃料（软化点：410°C )，作为低膨胀填料的堇青石粉末，具有Fe2O3-Cr2O 3-MnO-Co2O3的组成的激光吸收材料。  preparing a 83% by mass of Al2O3 play of 203,5% mass% mass% B2O 3Ul ZnOU mass and having an average particle diameter of 1 m 〇μ bismuth glass frit (softening point: 410 ° C ), cordierite powder as the low-expansion filler, a laser consisting of Fe2O3-Cr2O 3-MnO-Co2O3 absorbent material. 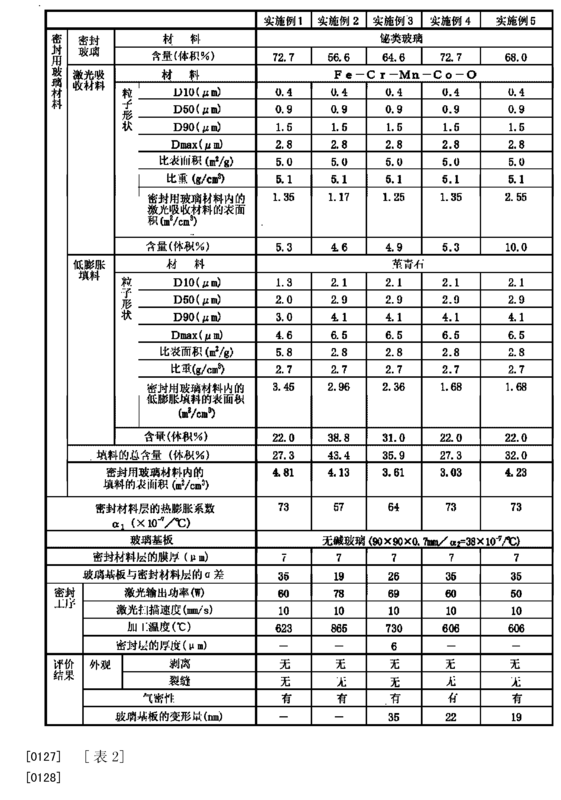 作为低膨胀填料的堇青石粉末具有DlO为L 3 μ m、D50为2. 0 μ m、D90为3. 0 μ m、Dmax为4. 6 μ m的粒度分布，并且比表面积为5. 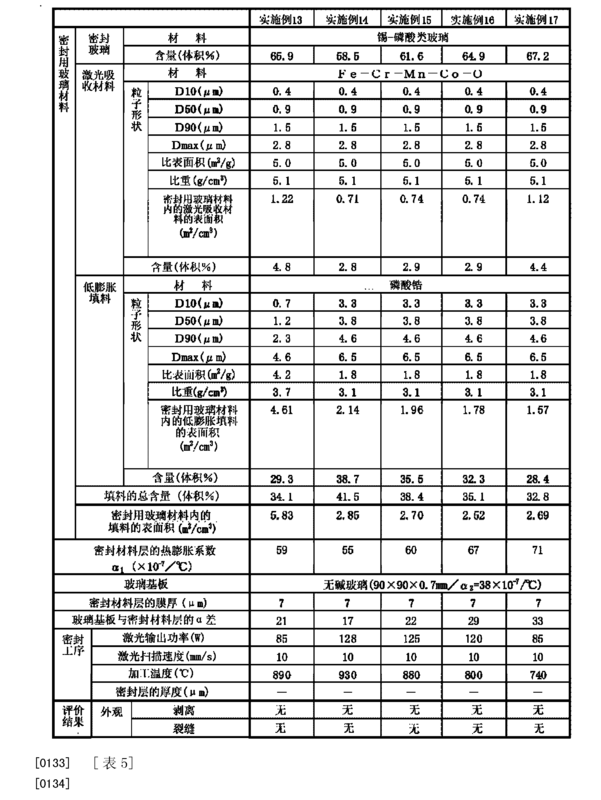 8m2/g。 As the low-expansion filler powder having cordierite as DlO L 3 μ m, D50 is 2. 0 μ m, D90 is 3. 0 μ m, Dmax is a particle size distribution 4. 6 μ m and a specific surface area of ​​5. 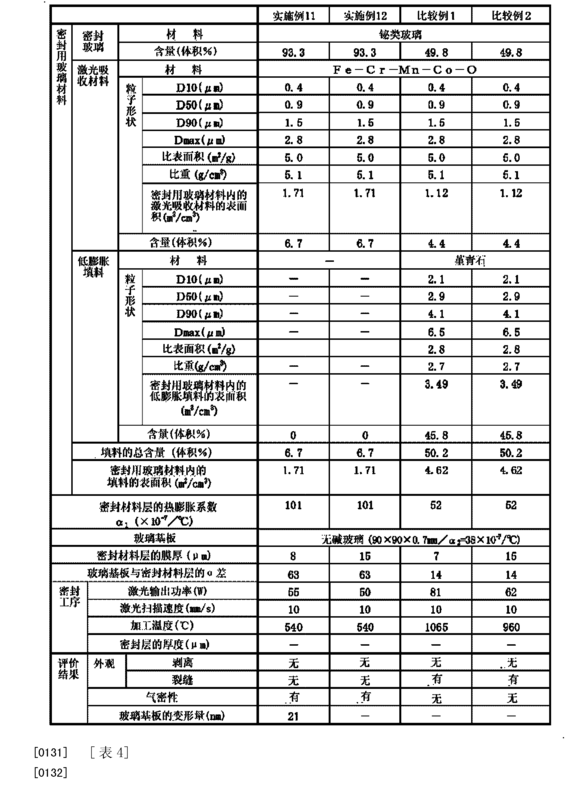 8m2 / g. 此外，激光吸收材料具有DlO为0· 4 μ m、D50为0· 9 μ m、D90为L 5 μ m、 Dmax为2. 8μπι的粒度分布，并且比表面积为5. 0m2/g。 Further, the laser absorbing material having a DlO is 0 · 4 μ m, D50 is 0 · 9 μ m, D90 is L 5 μ m, Dmax is 2. 8μπι particle size distribution and specific surface area of ​​5. 0m2 / g. 堇青石粉末和激光吸收材料的比表面积使用BET比表面积测定装置（蒙太可株式会社（^T 7々社）制造，Macsorb HMmodel-1201)进行测定。 The specific surface area of ​​the cordierite powder and laser absorbent BET specific surface area measurement device (Montague Ltd., (^ T 7々 Co.) for producing, Macsorb HMmodel-1201) was measured. 测定条件设定如下：吸附物质为氮气、载气为氦气、测定方法为流动法（BET -点法）、脱气温度为200°C、脱气时间为20分钟、脱气压力为N2气流/大气压、样品重量为lg。 The measurement conditions were set as follows: material is adsorbed nitrogen, helium carrier gas, a flow measurement method is method (BET - point method), degassing temperature of 200 ° C, degassing time of 20 minutes, a pressure of a stream of N2 degassed / atm, sample weight is lg. 下面的例子也同样。 The following examples are also the same. 将72. 7体积％的上述铋类玻璃料、22. 0体积％的堇青石粉末和5. 3体积％的激光吸收材料（堇青石粉末和激光吸收材料的总量为27. 3体积％ )混合制成密封用玻璃材料， 将80质量％的该密封用玻璃材料与20质量％的载体混合来制备密封材料糊料。  The 72.7% by volume of the bismuth glass frit, 22.0 vol% of the cordierite powder and 5.3 vol% of the laser absorbent material (cordierite powder and laser absorbent material to the total amount of 27.3 vol%) were mixed to prepare a sealing glass material, 80 mass% of this glass material for sealing with 20% by mass of the carrier were mixed to prepare a sealing material paste. 载体是将作为粘合剂成分的乙基纤维素（2. 5质量％ )溶解于由萜品醇组成的溶剂（97. 5质量％ ) 而得的载体。 The vector as a binder component is ethyl cellulose (2.5% by mass) is dissolved in a solvent of a carrier consisting of terpineol (97.5% by mass) obtained. 此外，堇青石粉末在密封用玻璃材料内的表面积为3. 45m2/cm3。 Further, the surface area of ​​the cordierite powder is in the sealing glass material is 3. 45m2 / cm3. 激光吸收材料在密封用玻璃材料内的表面积为I. 35m2/cm3。 Laser absorbent surface material within the glass material for sealing is I. 35m2 / cm3. 上述密封材料糊料的密封材料层的热膨胀系数ai (50 〜250°C )为73 X 1(T7/°C。 Thermal expansion coefficient of the sealing material layer of the sealing material paste ai (50 ~250 ° C) to 73 X 1 (T7 / ° C.
 另外，将上述密封材料糊料在密封玻璃的转变点以下KTC至转变点以下50°C的温度范围内（实施例1中为300°C )烧成2小时以除去溶剂和粘合剂成分，对在密封玻璃的软化点以上30°C至结晶化点以下30°C的温度范围内（实施例1中为480°C )烧结10分钟而获得的烧结体进行研磨，制成长度为20mm、直径为5mm的圆棒，用理学株式会社（U力' 々社）制造的TMA8310测定50〜250°C的温度范围内的平均线膨胀系数值，密封材料层的热膨胀系数Ci1即由该平均线膨胀系数值表示。  Further, the temperature range of the sealing material paste to KTC transition point of sealing glass transition point or less or less at 50 ° C (Example 1 300 ° C) calcined for 2 hours to remove the solvent and binder agent component of the seal above the softening point of between 30 ° C glass transition point of the crystallization temperature range of 30 ° C (as in Example 1 to 480 ° C) for 10 minutes to sinter the sintered body obtained is ground, having a length is 20mm, 5mm in diameter round bar, and by Rigaku Corporation (U force '々 Co.) TMA8310 manufactured by measuring the average line temperature range of 50~250 ° C the expansion value, the thermal expansion coefficient of the sealing material layer by the Ci1 i.e. the average value of the expansion. 以下，铋类玻璃的例子也同样。 Hereinafter, examples of the bismuth glass also. 本说明书中的转变点被定义为差示热分析（DTA)的第1拐点的温度，软化点被定义为差示热分析（DTA) 的第4拐点的温度，结晶化点被定义为差示热分析（DTA)的因结晶化而导致的发热达到峰值时的温度。 Transition point in this specification is defined as the temperature differential thermal analysis (DTA) in the first inflection point, a softening point is defined as a temperature differential thermal analysis (DTA) of 4 inflection point, crystallization point is defined as a differential thermal analysis (DTA) of heat due to crystallization caused the temperature reaches a peak. 接着，准备由无碱玻璃（热膨胀系数α2(50〜250°C) :38X1(T7/°C)形成的第二玻璃基板（尺寸：90X90X0. 7mmt)，通过丝网印刷法在该玻璃基板的密封区域内涂布密封材料糊料后，在120°CX 10分钟的条件下干燥。接着，通过对涂布层以480°CX 10分钟的条件进行烧成，从而形成膜厚T为7μπι的密封材料层。密封材料层（将上述密封材料糊料烧成后的材料）的热膨胀系数^^(73X10^/1：)与玻璃基板的热膨胀系数a 2(38Xl(T7/°C) 的差（ct r ct 2)为35 X 1(T7/°C。  Next, prepared by the alkali-free glass (thermal expansion coefficient α2 (50~250 ° C): a second glass substrate (size 38X1 (T7 / ° C) formed by:. 90X90X0 7mmt), by the screen printing method after the sealing material paste applied to the sealing region of the glass substrate, and dried at 120 ° CX ​​10 minutes. then, the coated layer by baking under the conditions 480 ° CX ​​10 minutes, thereby forming a thickness T 7μπι sealing material layer of thermal expansion coefficient of the sealing material layer (the material after the sealing material paste baking) of ^^ (73X10 ^ / 1 :) and the thermal expansion coefficient of the glass substrate of a 2 (38Xl (T7 / ° C) the difference (ct r ct 2) is 35 X 1 (T7 / ° C.
 将具有上述密封材料层的第二玻璃基板和具有元件区域（形成有OEL元件的区域）的第一玻璃基板（由具有与第二玻璃基板相同组成、相同形状的无碱玻璃形成的基板） 层叠。 (OEL element region is formed)  The second glass substrate having the sealing material layer and the element region having a first glass substrate (having the same composition as the second glass substrate, alkali-free glass formed in the same shape the substrate) are stacked. 接着，通过透过第二玻璃基板以10_/s的扫描速度对密封材料层照射波长为940nm、 输出功率为60W、斑点直径为I. 6mm的激光（半导体激光器），将密封材料层烙融并急冷固化，从而将第一玻璃基板和第二玻璃基板密封。 Next, the second glass substrate through a scanning speed 10_ / s of the sealing material layer was irradiated with a wavelength of 940nm, the output power of 60W, a spot diameter of the laser beam I. 6mm (semiconductor laser), the sealing material layer and baked into solidified by quenching, so as to seal the first glass substrate and the second glass substrate. 激光照射时的加工温度（用辐射温度计测定）为623°C。 Processing temperature (measured by a radiation thermometer) when laser irradiation was 623 ° C. 将由此以玻璃面板密封元件区域而得的电子器件供于下述的特性评价。 The evaluation thus characteristic to seal a glass panel member for electronic device obtained by the region in the following. 将具有表1及表2所示的粒子形状的堇青石粉末和激光吸收材料按照表1及表2 所示的比例和具有与实施例1相同组成的铋类玻璃料混合以制成密封用玻璃材料，接着， 与实施例1相同地使其与载体混合来制备密封材料糊料。  Table 1 particle having a shape shown in Table 2 and cordierite powder and laser absorbent were mixed to produce a 1 and Table 2 according to the ratio of the bismuth glass frit and the embodiment having the same composition as in Table 1 glass material for sealing, and then the manner in Example 1 mixed with a carrier to prepare a sealing material paste. 使用该密封材料糊料，进行与实施例1相同的操作，在第二玻璃基板上形成密封材料层。 Using this sealing material paste, the same operation as in Example 1, a sealing material layer formed on the second glass substrate. 密封用玻璃材料内的低膨胀填料以及激光吸收材料的表面积、密封材料层的热膨胀系数ai、与玻璃基板的热膨胀系数的差(a α 2)、密封材料层的膜厚如表1及表2所示。 Surface area of ​​the low-expansion filler and a laser in the glass material for sealing the absorbent material, the thermal expansion coefficient of the sealing layer is AI, the film thickness difference in thermal expansion coefficient of the glass substrate (a α 2), the sealing material layer as shown in Table 1 and Table 2 Fig. 接着，将具有密封材料层的第二玻璃基板与具有元件区域（形成有OEL元件的区域）的第一玻璃基板层叠。 The second glass substrate  Next, a sealing material layer having the first glass substrate laminate having an element region (element forming region on which an OEL) of. 第一玻璃基板和第二玻璃基板与实施例1同样由无碱玻璃形成。 The first glass substrate and the second glass substrate as in Example 1 formed of the same alkali-free glass. 接着，通过透过第二玻璃基板以l〇mm/s的扫描速度对密封材料层照射波长为940nm、斑点直径为I. 6mm的激光（半导体激光器），将密封材料层烙融并急冷固化，从而将第一玻璃基板和第二玻璃基板密封。 Next, the second glass substrate through a scanning speed l〇mm / s of the sealing material layer was irradiated with a wavelength of 940nm, a spot diameter of the laser beam I. 6mm (semiconductor laser), the sealing material layer is baked and solidified by quenching melt, whereby the first glass substrate and the second glass substrate sealing. 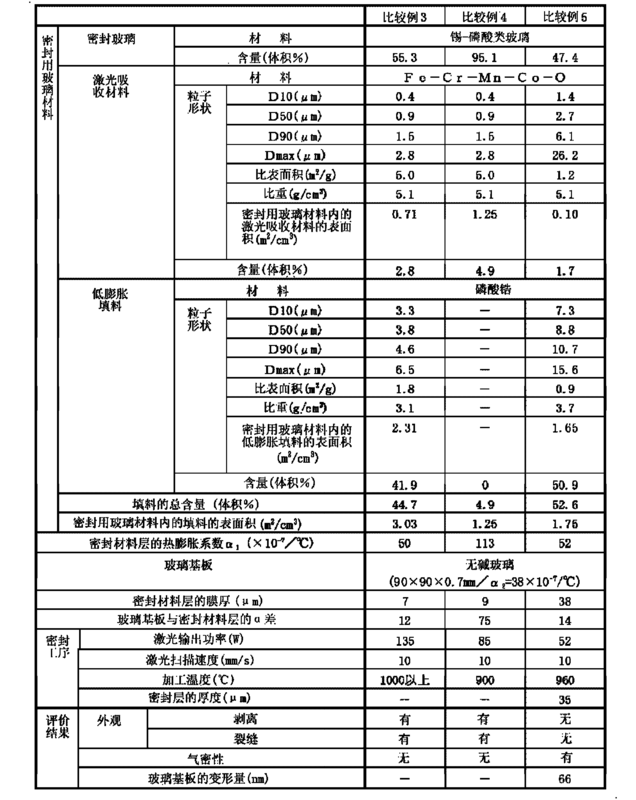 激光的输出功率采用表1及表2中所示的值。 Power of the laser output values ​​shown in Table 1 and Table 2. 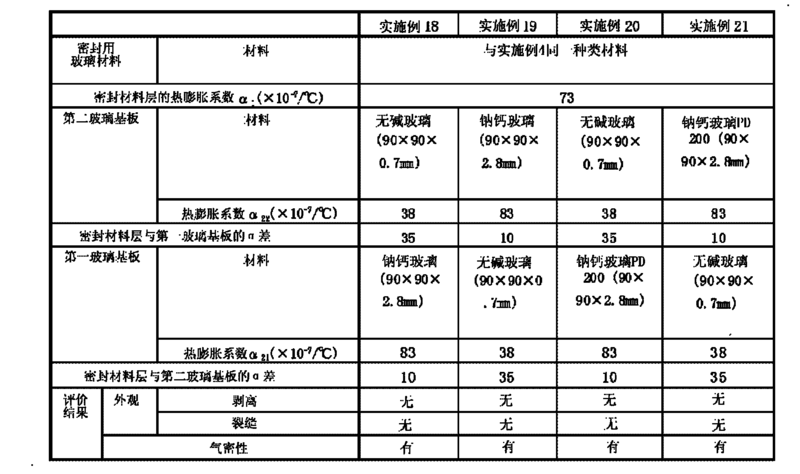 激光加工温度如表1及表2所示。 Laser processing temperature as shown in Table 1 and Table 2. 将由此以玻璃面板密封元件区域而得的电子器件供于下述的特性评价。 The evaluation thus characteristic to seal a glass panel member for electronic device obtained by the region in the following. 将具有表3所示的粒子形状的激光吸收材料按照表3所示的比例和具有与实施例1相同组成的铋类玻璃料混合以制成密封用玻璃材料，接着，与实施例1相同地使其与载体混合来制备密封材料糊料。  The laser light having the particle shape shown in Table 3 to prepare a mixed material absorbing glass material for sealing in the proportions shown in Table 3 and the same bismuth glass frit having the composition of Example 1, followed by Example 1 in the same manner so as to prepare a sealing material paste mixed with a carrier. 这里没有使用低膨胀填料。 There is no low-expansion filler used. 使用该密封材料糊料，进行与实施例1相同的操作，在第二玻璃基板上形成密封材料层。 Using this sealing material paste, the same operation as in Example 1, a sealing material layer formed on the second glass substrate. 密封用玻璃材料内的激光吸收材料的表面积、密封材料层的热膨胀系数Ci 1、与玻璃基板的热膨胀系数的差（Ci1-Ci2)、密封材料层的膜厚如表3所示。 Thickness of the surface area of ​​the laser in the glass material for sealing the absorbent material, the difference in coefficient of thermal expansion coefficients of the sealing material layer Ci 1, the thermal expansion and the glass substrate (Ci1-Ci2), the sealing material layer as shown in Table 3. 接着，将具有密封材料层的第二玻璃基板与具有元件区域（形成有OEL元件的区域）的第一玻璃基板层叠。 The second glass substrate  Next, a sealing material layer having the first glass substrate laminate having an element region (element forming region on which an OEL) of. 第一玻璃基板和第二玻璃基板与实施例1同样由无碱玻璃形成。 The first glass substrate and the second glass substrate as in Example 1 formed of the same alkali-free glass. 接着，通过透过第二玻璃基板以10_/s的扫描速度对密封材料层照射波长为940nm、斑点直径为I. 6mm的激光（半导体激光器），将密封材料层烙融并急冷固化，从而将第一玻璃基板和第二玻璃基板密封。 Next, the second glass substrate through a scanning speed 10_ / s of the sealing material layer was irradiated with a wavelength of 940nm, a spot diameter of the laser beam I. 6mm (semiconductor laser), the sealing material layer is baked and solidified by quenching melt, thereby first glass substrate and the second glass substrate sealing. 激光的输出功率采用表3中所示的值。 Output power of the laser using the values ​​shown in Table 3. 激光加工温度如表3所示。 Laser processing temperature as shown in Table 3. 将由此以玻璃面板密封元件区域而得的电子器件供于下述的特性评价。 The evaluation thus characteristic to seal a glass panel member for electronic device obtained by the region in the following. 将具有表3所示的粒子形状的堇青石粉末和激光吸收材料按照表3所示的比例和具有与实施例1相同组成的铋类玻璃料混合以制成密封用玻璃材料，接着，与实施例1相同地使其与载体混合来制备密封材料糊料。 Cordierite powder and laser  The particles having a shape shown in Table 3 to prepare a mixed material absorbing glass material for sealing in the proportions shown in Table 3 and the same bismuth glass frit having the composition of Example 1, followed by , mixing it with the carrier 1 in the same manner in Example was prepared sealing material paste. 使用该密封材料糊料，进行与实施例1相同的操作，在第二玻璃基板上形成密封材料层。 Using this sealing material paste, the same operation as in Example 1, a sealing material layer formed on the second glass substrate. 密封用玻璃材料内的低膨胀填料和激光吸收材料的表面积、密封材料层的热膨胀系数CI 1、与玻璃基板的热膨胀系数的差（α「α2)、密封材料层的膜厚如表3所示。比较例1〜2为向密封用玻璃材料中添加较大量的低膨胀填料(堇青石粉末）使得密封材料层与玻璃基板的热膨胀系数的差（ar α 2)低于15 X 10_7/°C 的例子。 Surface area of ​​sealing the absorbent material with the low-expansion filler and a laser light within the glass material, CI 1, the film thickness of the thermal expansion coefficient of the sealing material layer and the difference coefficients of the glass substrate thermal expansion ([alpha] "α2), the sealing material layer as shown in Table 3 Comparative Examples 1 to 2 was added a relatively large amount of low-expansion filler (cordierite powder) to a sealing glass material such that a difference in coefficient of the sealing material layer and the thermal expansion of the glass substrate (ar α 2) is less than 15 X 10_7 / ° C example of. 接着，将具有密封材料层的第二玻璃基板与具有元件区域（形成有OEL元件的区域）的第一玻璃基板层叠。 The second glass substrate  Next, a sealing material layer having the first glass substrate laminate having an element region (element forming region on which an OEL) of. 第一玻璃基板和第二玻璃基板与实施例1同样由无碱玻璃形成。 The first glass substrate and the second glass substrate as in Example 1 formed of the same alkali-free glass. 接着，通过透过第二玻璃基板以l〇mm/s的扫描速度对密封材料层照射波长为940nm、斑点直径为I. 6mm的激光（半导体激光器），将密封材料层烙融并急冷固化，从而将第一玻璃基板和第二玻璃基板密封。 Next, the second glass substrate through a scanning speed l〇mm / s of the sealing material layer was irradiated with a wavelength of 940nm, a spot diameter of the laser beam I. 6mm (semiconductor laser), the sealing material layer is baked and solidified by quenching melt, whereby the first glass substrate and the second glass substrate sealing. 激光的输出功率根据低膨胀填料的含量采用表3中所示的值。 Output power of the laser using the values ​​shown in Table 3. The content of the low-expansion filler. 激光加工温度如表3所示。 Laser processing temperature as shown in Table 3. 将由此制成的电子器件供于下述的特性评价。 The electronic device thus prepared for characteristic evaluation described later on. 将65. 9体积％的上述锡-磷酸类玻璃料、29. 3体积％的磷酸锆粉末和4. 8体积％ 的激光吸收材料（磷酸锆粉末和激光吸收材料的总量为34. 1体积％ )混合制成密封用玻璃材料，将83质量％的该密封用玻璃材料与17质量％的载体混合来制备密封材料糊料。  The 65.9% by volume of the above-described tin - phosphate glass frit, 293% by volume of the zirconium phosphate powder and 4.8 vol% of the laser absorbent material (zirconium powder and the amount of laser absorbing material 34 phosphate 1% by volume) were mixed to prepare a sealing glass material, 83 mass% to the glass material for sealing with 17 mass% of the carrier were mixed to prepare a sealing material paste. 载体是将作为粘合剂成分的硝基纤维素（4质量％ )溶解于由丁基卡必醇乙酸酯组成的溶剂(96质量％ )而得的载体。 The carrier is dissolved as nitrocellulose (4 mass%) in a solvent by the binder component is butyl carbitol acetate composition (96 mass%) obtained by the carrier. 上述磷酸锆粉末在密封用玻璃材料内的表面积为4. 61m2/cm3。  The surface area of ​​the zirconium phosphate powder in a sealing glass material is 4. 61m2 / cm3. 上述激光吸收材料在密封用玻璃材料内的表面积为1.22m 2/cm3。 Surface area of ​​the laser absorbent in the sealing glass material is 1.22m 2 / cm3. 另外，上述密封材料糊料的密封材料层的热膨胀系数ai (50 〜250°C )为59X 10_7/°C。 Further, the thermal expansion coefficient of the sealing material layer of the sealing material paste ai (50 ~250 ° C) for the 59X 10_7 / ° C.
 另外，将上述密封材料糊料在密封玻璃的转变点以下KTC至转变点以下50°C的温度范围内（实施例13中为250°C )烧成2小时以除去溶剂和粘合剂成分，对在密封玻璃的软化点以上30°C至结晶化点以下30°C的温度范围内（实施例13中为430°C )烧结10 分钟而获得的烧结体研磨，制成长度为20mm、直径为5mm的圆棒，用理学株式会社制造的TMA8310测定50〜250°C的温度范围内的平均线膨胀系数值，密封材料层的热膨胀系数α I 即由该平均线膨胀系数值表示。  Further, the temperature range of the sealing material paste to KTC transition point of sealing glass transition point or less or less at 50 ° C (Example 13 to 250 ° C) calcined for 2 hours to remove the solvent and binder agent component above the softening point of the sealing glass in a temperature range of 30 ° C crystallization point or less to 30 ° C (Example 13 to 430 ° C) triturated sintered body obtained by sintering for 10 minutes, having a length of 20mm, 5mm in diameter round bar, TMA8310 manufactured by Rigaku Corporation to determine the average line temperature range of 50~250 ° C the expansion value, the thermal expansion coefficient of the sealing material layer is represented by α I i.e., the average expansion coefficient values . 以下，锡-磷酸类玻璃的例子也同样。 Hereinafter, tin - an example of phosphate glass equally. 将具有上述密封材料层的第二玻璃基板和具有元件区域（形成有OEL元件的区域）的第一玻璃基板（由具有与第二玻璃基板相同组成、相同形状的无碱玻璃形成的基板） 层叠。 (OEL element region is formed)  The second glass substrate having the sealing material layer and the element region having a first glass substrate (having the same composition as the second glass substrate, alkali-free glass formed in the same shape the substrate) are stacked. 接着，通过透过第二玻璃基板以10_/s的扫描速度对密封材料层照射波长为940nm、 输出功率为85W、斑点直径为I. 6mm的激光（半导体激光器），将密封材料层熔融并急冷固化，从而将第一玻璃基板和第二玻璃基板密封。 Next, the second glass substrate through a scanning speed 10_ / s of the sealing material layer was irradiated with a wavelength of 940nm, the output power is 85W, a spot diameter of the laser beam I. 6mm (semiconductor laser), the sealing material layer is melted and quenched cured, thereby sealing the first glass substrate and the second glass substrate. 激光照射时的加工温度（用辐射温度计测定）为890°C。 Processing temperature (measured by a radiation thermometer) when laser irradiation was 890 ° C. 将由此以玻璃面板密封元件区域而得的电子器件供于下述的特性评价。 The evaluation thus characteristic to seal a glass panel member for electronic device obtained by the region in the following. 将具有表4所示的粒子形状的磷酸锆粉末和激光吸收材料按照表4所示的比例和具有与实施例13相同组成的锡-磷酸类玻璃料混合来制备密封用玻璃材料。  A table having a tin and zirconium phosphate powder particle shape of laser absorbing material shown in FIG. 4 in the proportions shown in Table 4 and having the same composition as Example 13 - phosphate glass frit were mixed to prepare a glass material for sealing. 接着，与实施例13相同地将密封用玻璃材料与载体混合来制备密封材料糊料，使用该制得的密封材料糊料进行与实施例13相同的操作，在第二玻璃基板上形成密封材料层。 Next, a sealing material paste 13 was prepared in the same manner by mixing with a carrier the glass material for sealing embodiment, a sealing material paste was subjected to the same operation as in Example 13, a sealing material is formed on the second glass substrate Floor. 密封用玻璃材料内的低膨胀填料和激光吸收材料的表面积、密封材料层的热膨胀系数ai、与玻璃基板的热膨胀系数的差（α「α 2)、密封材料层的膜厚如表4所示。 Surface area of ​​sealing the absorbent material with the low-expansion filler and a laser light within the glass material, the thermal expansion coefficient of the sealing layer is AI, the film thickness and the difference coefficients of the glass substrate thermal expansion ([alpha] "α 2), the sealing material layer as shown in Table 4 . 接着，将具有密封材料层的第二玻璃基板与具有元件区域（形成有OEL元件的区域）的第一玻璃基板层叠。 The second glass substrate  Next, a sealing material layer having the first glass substrate laminate having an element region (element forming region on which an OEL) of. 第一玻璃基板和第二玻璃基板与实施例13同样由无碱玻璃形成。 The first glass substrate and the second glass substrate as in Example 13 is formed of alkali-free glass. 接着，通过透过第二玻璃基板以10_/s的扫描速度对密封材料层照射波长为940nm、斑点直径为I. 6mm的激光（半导体激光器），将密封材料层烙融并急冷固化，从而将第一玻璃基板和第二玻璃基板密封。 Next, the second glass substrate through a scanning speed 10_ / s of the sealing material layer was irradiated with a wavelength of 940nm, a spot diameter of the laser beam I. 6mm (semiconductor laser), the sealing material layer is baked and solidified by quenching melt, thereby first glass substrate and the second glass substrate sealing. 激光的输出功率采用表4中所示的值。 Output power of the laser using the values ​​shown in Table 4. 激光加工温度如表4所示。 Laser processing temperature shown in Table 4. 将由此以玻璃面板密封元件区域而得的电子器件供于下述的特性评价。 The evaluation thus characteristic to seal a glass panel member for electronic device obtained by the region in the following. 将具有表5所示的粒子形状的磷酸锆粉末和激光吸收材料按照表5所示的比例和具有与实施例13相同组成的锡-磷酸类玻璃料混合来制备密封用玻璃材料。 Tin absorbing material in the same proportions as shown in Table 5 and having the composition of Example 13  The zirconium phosphate powder having the particle shape and the laser shown in Table 5 - phosphate glass frit were mixed to prepare a glass material for sealing. 接着，与实施例13相同地将密封用玻璃材料与载体混合来制备密封材料糊料，使用该制得的密封材料糊料进行与实施例13相同的操作，在第二玻璃基板上形成密封材料层。 Next, a sealing material paste 13 was prepared in the same manner by mixing with a carrier the glass material for sealing embodiment, a sealing material paste was subjected to the same operation as in Example 13, a sealing material is formed on the second glass substrate Floor. 密封用玻璃材料内的低膨胀填料和激光吸收材料的表面积、密封材料层的热膨胀系数ai、与玻璃基板的热膨胀系数的差（Ci1-Ci 2)、密封材料层的膜厚如表5所示。 Surface area of ​​the low-expansion filler and a laser in the glass material for sealing the absorbent material, the thermal expansion coefficient of the sealing layer is AI, the film thickness and the difference in the coefficient of the glass substrate thermal expansion (Ci1-Ci 2), the sealing material layer as shown in Table 5 . 比较例3为向密封用玻璃材料中添加较大量的低膨胀填料（磷酸锆粉末）使得密封材料层与玻璃基板的热膨胀系数的差(a ra2)低于15X10-7/。 Comparative Example 3 is added a relatively large amount of low-expansion filler (zirconium phosphate powder) to a sealing glass material such that a difference in coefficient of the sealing material layer and the thermal expansion of the glass substrate (a ra2) is less than 15X10-7 /. 。 . 的例子。 example of. 接着，将具有密封材料层的第二玻璃基板与具有元件区域（形成有OEL元件的区域）的第一玻璃基板层叠。 The second glass substrate  Next, a sealing material layer having the first glass substrate laminate having an element region (element forming region on which an OEL) of. 第一玻璃基板和第二玻璃基板与实施例13同样由无碱玻璃形成。 The first glass substrate and the second glass substrate as in Example 13 is formed of alkali-free glass. 接着，通过透过第二玻璃基板以10_/s的扫描速度对密封材料层照射波长为940nm、斑点直径为I. 6mm的激光（半导体激光器），将密封材料层烙融并急冷固化，从而将第一玻璃基板和第二玻璃基板密封。 Next, the second glass substrate through a scanning speed 10_ / s of the sealing material layer was irradiated with a wavelength of 940nm, a spot diameter of the laser beam I. 6mm (semiconductor laser), the sealing material layer is baked and solidified by quenching melt, thereby first glass substrate and the second glass substrate sealing. 激光的输出功率根据低膨胀填料的含量采用表5中所示的值。 Laser output takes the value shown in Table 5 according to the content of the low-expansion filler. 激光加工温度如表5所示。 Laser processing temperature as shown in Table 5. 将由此制成的电子器件供于下述的特性评价。 The electronic device thus prepared for characteristic evaluation described later on. 将具有表5所示的粒子形状的激光吸收材料按照表5所示的比例和具有与实施例13相同组成的锡-磷酸类玻璃料混合来制备密封用玻璃材料。  The particles having a shape shown in Table laser absorbing material 5 in the proportions shown in Table 5 and having the same tin composition as in Example 13 - to prepare a glass material for sealing phosphate glass frit mixture. 这里没有使用低膨胀填料。 There is no low-expansion filler used. 接着，与实施例13相同地将密封用玻璃材料与载体混合来制备密封材料糊料，使用该制得的密封材料糊料进行与实施例13相同的操作，在第二玻璃基板上形成密封材料层。 Next, a sealing material paste 13 was prepared in the same manner by mixing with a carrier the glass material for sealing embodiment, a sealing material paste was subjected to the same operation as in Example 13, a sealing material is formed on the second glass substrate Floor. 密封材料层的热膨胀系数O 1为113X10_7/°C，与玻璃基板的热膨胀系数a2(38Xl(T7/°C )的差(ara 2)为75 X 10_7/。。。密封用玻璃材料内的激光吸收材料的表面积、密封材料层的膜厚如表5所示。 Thermal expansion coefficient of the sealing material layer O 1 is 113X10_7 / ° C, the thermal expansion of the glass substrate has a coefficient a2 (38Xl (T7 / ° C) of the difference (ara 2) is 75 X 10_7 / ... laser light within the glass material for sealing thickness of the surface area of ​​sealing material layer of absorbent material, as shown in table 5. 接着，将具有密封材料层的第二玻璃基板与具有元件区域（形成有OEL元件的区域）的第一玻璃基板层叠。 The second glass substrate  Next, a sealing material layer having the first glass substrate laminate having an element region (element forming region on which an OEL) of. 第一玻璃基板和第二玻璃基板与实施例13同样由无碱玻璃形成。 The first glass substrate and the second glass substrate as in Example 13 is formed of alkali-free glass. 接着，通过透过第二玻璃基板以10_/s的扫描速度对密封材料层照射波长为940nm、斑点直径为I. 6mm的激光（半导体激光器），将密封材料层烙融并急冷固化，从而将第一玻璃基板和第二玻璃基板密封。 Next, the second glass substrate through a scanning speed 10_ / s of the sealing material layer was irradiated with a wavelength of 940nm, a spot diameter of the laser beam I. 6mm (semiconductor laser), the sealing material layer is baked and solidified by quenching melt, thereby first glass substrate and the second glass substrate sealing. 激光的输出功率采用表5中所示的值。 Power of the laser output values ​​shown in Table 5. 激光加工温度如表5所示。 Laser processing temperature as shown in Table 5. 将由此以玻璃面板密封元件区域而得的电子器件供于下述的特性评价。 The evaluation thus characteristic to seal a glass panel member for electronic device obtained by the region in the following. 将具有表5所示的粒子形状的磷酸锆粉末和激光吸收材料按照表5所示的比例和具有与实施例13相同组成的锡-磷酸类玻璃料混合来制备密封用玻璃材料。 Tin absorbing material in the same proportions as shown in Table 5 and having the composition of Example 13  The zirconium phosphate powder having the particle shape and the laser shown in Table 5 - phosphate glass frit were mixed to prepare a glass material for sealing. 调整磷酸锆粉末和激光吸收材料以使膜厚达到38 μ m。 Adjusting zirconium phosphate powder and laser absorbent material to a film thickness of 38 μ m. 接着，与实施例13相同地将密封用玻璃材料与载体混合来制备密封材料糊料，使用该制得的密封材料糊料进行与实施例13相同的操作， 在第二玻璃基板上形成膜厚为38 μ m的密封材料层。 Next, a sealing material paste 13 was prepared in the same manner by mixing with a carrier the glass material for sealing embodiment, a sealing material paste was subjected to the same operation as in Example 13, a film thickness is formed on the second glass substrate a sealing material layer of 38 μ m.
 接着，将具有密封材料层的第二玻璃基板与具有元件区域（形成有OEL元件的区域）的第一玻璃基板层叠。 The second glass substrate  Next, a sealing material layer having the first glass substrate laminate having an element region (element forming region on which an OEL) of. 第一玻璃基板和第二玻璃基板与实施例13同样由无碱玻璃形成。 The first glass substrate and the second glass substrate as in Example 13 is formed of alkali-free glass. 接着，通过透过第二玻璃基板以10_/s的扫描速度对密封材料层照射波长为940nm、斑点直径为I. 6mm的激光（半导体激光器），将密封材料层烙融并急冷固化，从而将第一玻璃基板和第二玻璃基板密封。 Next, the second glass substrate through a scanning speed 10_ / s of the sealing material layer was irradiated with a wavelength of 940nm, a spot diameter of the laser beam I. 6mm (semiconductor laser), the sealing material layer is baked and solidified by quenching melt, thereby first glass substrate and the second glass substrate sealing. 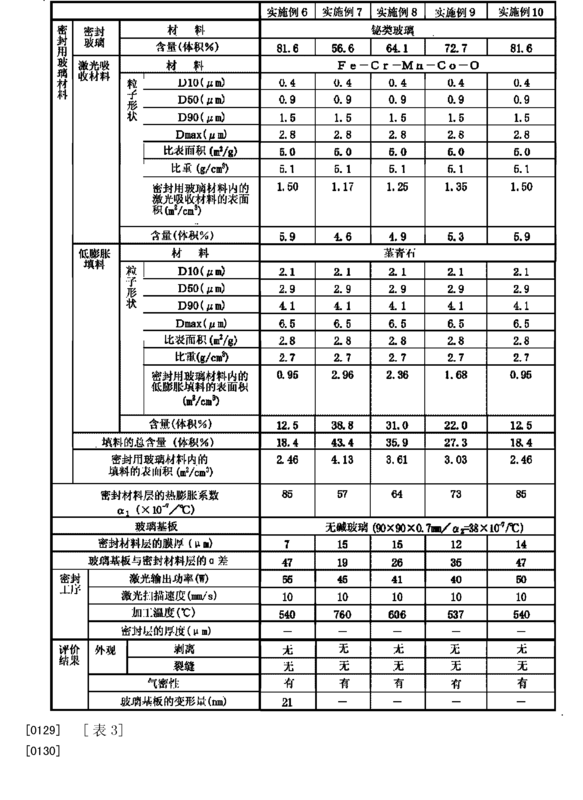 激光的输出功率采用表5中所示的值。 Power of the laser output values ​​shown in Table 5. 激光加工温度如表5所示。 Laser processing temperature as shown in Table 5. 将由此制成的电子器件供于下述的特性评价。 The electronic device thus prepared for characteristic evaluation described later on. 接着，对于实施例1〜17和比较例1〜5的玻璃面板的外观，评价了激光的照射终点处的密封层的剥离、玻璃基板和密封层的裂缝。  Next, the appearance of the glass panel 1~17 Examples 1 ~ 5 and Comparative Examples were evaluated for cracks in the sealing layer of the release at the end of the laser irradiation, the glass substrate and the sealing layer. 外观用光学显微镜观察来进行评价。 The appearance was observed with an optical microscope and evaluated. 各玻璃面板的气密性使用氦泄漏试验进行评价。 Airtightness of each glass panel was evaluated using a helium leak test. 而且，按照以下方法测定了各例的密封层的厚度。 Further, the measured thickness of each example of the sealing layer by the following method. 此外，按照以下方法测定了在各例的条件下密封时的玻璃的变形。 In addition, deformation of the glass when measured under the conditions of sealing each example by the following method. 这些测定和评价结果与玻璃面板的制造条件一并不于表1至表5。 The results of measurement and evaluation of a glass panel manufacturing conditions not shown in Table 1 to Table 5. 密封层的厚度按照以下方法测定。  The thickness of the sealing layer is measured according to the following method. 通过用切粒机切开由密封层密封的各例的玻璃面板，用扫描型电子显微镜来观察截面，从而测出密封层的厚度。 Example glass panel through the incision sealed by a sealing layer using a cutter with a scanning electron microscope to observe the cross section, thereby measuring the thickness of the sealing layer. 玻璃基板的变形测定按以下方式实施。 Deformation of  embodiment of the glass substrate in the following manner. 首先，在截面经镜面研磨的无碱玻璃基板（10X60X0. 7mmt)上，用丝网印刷法涂布各例的密封材料糊料后，用间歇式干燥炉在120°C XlO分钟的条件下使其干燥。 First, on a glass substrate, alkali-free mirror-polished cross-section (10X60X0. 7mmt), a sealing material paste is applied in each Example by screen printing, so that a batch drying oven at 120 ° C XlO minutes to dry. 接着，通过在对于各糊料最适合的烧成条件下于烧成炉中进行烧成，从而形成线宽1mm、长度30mm、厚度7 μ m(对于比较例5,厚度为38 μ m)的密封材料层。 Next, the paste for each of the optimum firing condition fired in a firing furnace, thereby forming a line width of 1mm, a length of 30mm, a thickness of 7 μ m (for Comparative Example 5, having a thickness of 38 μ m) of a sealing material layer. 将这样的带密封材料层的玻璃基板与另一块无碱玻璃基板层叠后，在加重500g 的条件下以l〇mm/s的扫描速度照射波长为940nm、斑点直径为I. 6mm的激光进行粘接。 Such a glass substrate with a sealing material layer with one another after the alkali-free glass substrate laminated under the conditions of a scanning speed increase 500g illumination wavelengths l〇mm / s is 940nm, a spot diameter of the laser beam I. 6mm sticky access. 激光的输出功率按照各例需求进行调整。 Output of the laser is adjusted according to the needs of each example. 由此，制成密封材料层的粘接面积（密封材料层的熔融固着层与玻璃基板粘接的面积）S2对粘接前的密封材料层的面积Sl的比（S2/S1)为90〜95%的样品。  Thus, the sealing material layer made of an adhesive area (sealing material layer melt-bonding area of ​​the bonding layer and the glass substrate) than the area Sl of the sealing material layer before the adhesive S2 (S2 / S1) It is 90~95% of the samples. 对各样品的玻璃基板的变形量进行了测定。 Amount of deformation of the glass substrate of each sample was measured. 变形量的测定为使用双折射成像系统从截面观察各样品， 对玻璃基板产生的变形（滞后（retardation) :nm)进行测定。 Determination of the amount of deformation of an imaging system using a birefringent observed from the cross section of each sample, the deformation of the glass substrate generated (hysteresis (retardation): nm) was measured. 由表1和表5可知，实施例1〜17的玻璃面板的外观和气密性均良好，且玻璃基板的变形量也较少。  As apparent from Table 1 and Table 5, the appearance of the glass panel of the embodiment of Example 1~17 were good and airtight, and the amount of deformation of the glass substrate is also less. 对于玻璃基板的变形量，与将密封材料层的膜厚变厚为38 μ m、使激光加工温度下降了的比较例5的玻璃面板的变形量相比，密封材料层的膜厚较薄为15μπι以下的实施例3〜6的玻璃面板的变形量较小，所以确认到了以良好的状态密封的结果。 For the amount of deformation of the glass substrate, and the film thickness of the sealing material layer becomes thick as 38 μ m, the laser processing temperature lowered amount of deformation of the glass panel in Comparative Example 5 as compared to the film thickness of the sealing material layer is thin the amount of deformation of the glass panel of Example 3 ~ 6 15μπι less small, the results confirmed that a good sealing state. 另一方面，在将低膨胀填料的含量增多、相应地升高了激光加工温度的比较例1〜3中，由于在激光密封工序时玻璃基板中产生的残留应力大，所以确认到了在玻璃基板和密封层产生了裂缝。 On the other hand, the increase in the content of the low-expansion filler, correspondingly elevated temperatures Comparative Examples 1 ~ 3 in the laser processing, due to the large residual stress is generated in the glass substrate during the laser sealing step, it was confirmed that the glass substrate and a sealing layer generates cracks. 此外，即使在将填料量减至极少的比较例4中，也确认到了在玻璃基板和密封层产生了裂缝。 Further, even when the amount of filler in Comparative Example 4 little reduced, but also confirmed that the glass substrate and the sealing layer generates cracks. 使用含有与实施例4相同的密封用玻璃材料的密封材料糊料，进行与实施例4相同的操作，在由无碱玻璃形成的第二玻璃基板（热膨胀系数a 22 :38Xl(T7/°C)上形成密封材料层（密封材料层的热膨胀系数ai :73X1(T/°C )。密封材料层与第二玻璃基板的热膨胀差为35X1(T7/°C。接着，准备由钠钙玻璃形成的第一玻璃基板（热膨胀系数Ci 21: 83X1(T/°C )，将其与上述第二玻璃基板层叠。第一玻璃基板与密封材料层的热膨胀差为10 X 1(T7/°C。其后，在与实施例4相同的条件下照射激光，将第一玻璃基板和第二玻璃基板密封。对由此得到的玻璃面板的外观和气密性按照上述方法进行评价。其结果示于表6。  using the sealing material paste comprising the same as in Example 4, a sealing glass material, the same operation as in Example 4, the second glass substrate formed of alkali-free glass (thermal expansion coefficient of a 22: 38Xl (T7 forming a sealing material layer / ° C) (thermal expansion coefficient of the sealing material layer ai: 73X1 (T / ° C) thermal expansion difference between the sealing material layer and a second glass substrate is 35X1 (T7 / ° C Next, prepared from sodium. the first glass substrate lime glass (thermal expansion coefficient Ci 21: 83X1 (T / ° C), which is laminated to the second glass substrate in thermal expansion difference between the first glass substrate and the sealing material layer is 10 X 1 (T7 /. ° C. Thereafter, irradiated under the same conditions as in Example 4 laser, the first glass substrate and the second glass substrate sealed airtight and the appearance of a glass panel thus obtained was evaluated as described above. As a result, are shown in table 6. 使用含有与实施例4相同的密封用玻璃材料的密封材料糊料，并使用由钠钙玻璃形成的第二玻璃基板（热膨胀系数a 22 : 83X 1(T7/°C )，除此以外进行与实施例4相同的操作来形成密封材料层（密封材料层的热膨胀系数ai :73X1(T/°C )。密封材料层与第二玻璃基板的热膨胀差为IOX 1(T7/°C。接着，准备由无碱玻璃形成的第一玻璃基板（热膨胀系数〇21:38\10〃/°〇，将其与上述第二玻璃基板层叠。第一玻璃基板与密封材料层的热膨胀差为35X1(T 7/°C。其后，在与实施例4相同的条件下照射激光，将第一玻璃基板和第二玻璃基板密封。对由此得到的玻璃面板的外观和气密性按照上述方法进行评价。其结果示于表6。  using the sealing material paste comprising the same sealing glass material in Example 4, and a second glass substrate (thermal expansion coefficient a 22 is formed of soda lime glass: 83X 1 (T7 / ° C), In addition except perform the same operation as in Example 4 to form a sealing material layer (the thermal expansion coefficient of the sealing material layer ai:. 73X1 (T / ° C) heat-sealing material layer and the second glass substrate expansion difference IOX 1 (T7 / ° C Next, prepare the alkali-free glass formed from a first glass substrate (thermal expansion coefficient 〇21: 38 \ 10〃 / ° billion, which is laminated to the second glass substrate and the glass substrate, the thermal expansion of the first sealing material layer is poor. Thereafter, irradiation 35X1 (T 7 / ° C under the same conditions as in Example 4 laser, the first glass substrate and the second glass substrate sealed airtight and the appearance of a glass panel thus obtained as described above The method was evaluated. The results are shown in table 6. 使用含有与实施例4相同的密封用玻璃材料的密封材料糊料，进行与实施例4相同的操作，在由无碱玻璃形成的第二玻璃基板（热膨胀系数a 22 :38X 1(T7/°C )上形成密封材料层（密封材料层的热膨胀系数ai :73X1(T7/°C )。密封材料层与第二玻璃基板的热膨胀差为35X1(T/°C。接着，准备作为第一玻璃基板的钠钙玻璃基板Η)200(商品名，旭硝子株式会社制造（热膨胀系数Ci 21 :83X1(T7/°C ))，将其与上述第二玻璃基板层叠。第一玻璃基板与密封材料层的热膨胀差为IOX 1(T7/°C。其后，在与实施例4相同的条件下照射激光，将第一玻璃基板和第二玻璃基板密封。对由此得到的玻璃面板的外观和气密性按照上述方法进行评价。其结果示于表6。  using the same sealing material paste containing the glass material for sealing in Example 4, the same operation as in Example 4, in a second glass substrate (thermal expansion coefficient of alkali-free glass is formed by a 22: 38X 1 ( forming a sealing material layer on the T7 / ° C) (thermal expansion coefficient of the sealing material layer ai: 73X1 (T7 / ° C) thermal expansion difference between the sealing material layer and a second glass substrate is 35X1 (T / ° C Next, prepared as. Η soda lime glass substrate of a first glass substrate) 200 (trade name, manufactured by Asahi glass Co., Ltd. (thermal expansion coefficient Ci 21: 83X1 (T7 / ° C))., which is laminated to the second glass substrate and the first glass substrate thermal expansion of the sealing material layer difference IOX 1 (T7 / ° C. Thereafter, laser light is irradiated under the same conditions as in Example 4, the first glass substrate and the second glass substrate seal of the glass panel thus obtained appearance and airtightness was evaluated as described above. The results are shown in table 6. 使用含有与实施例4相同的密封用玻璃材料的密封材料糊料，并使用作为第二玻璃基板的钠钙玻璃基板Η)200(商品名，旭硝子株式会社制造（热膨胀系数α 22: 83X KT7/°C ))，除此以外进行与实施例4相同的操作来形成密封材料层（密封材料层的热膨胀系数Ci1 :73X 1(T7/°C)。密封材料层与第二玻璃基板的热膨胀差为IOX 10_7/°C。接着，准备由无碱玻璃形成的第一玻璃基板（热膨胀系数a21 :38X1(T/°C )，将其与上述第二玻璃基板层叠。第一玻璃基板与密封材料层的热膨胀差为35X1(T7/°C。其后，在与实施例4相同的条件下照射激光，将第一玻璃基板和第二玻璃基板密封。对由此得到的玻璃面板的外观和气密性按照上述方法进行评价。其结果示于表6。  using the sealing material paste comprising the same sealing glass material in Example 4, and using as the soda lime glass substrate Η second glass substrate) 200 (trade name, manufactured by Asahi Glass Co., Ltd. (thermal expansion coefficient α 22: 83X KT7 / ° C)), except for the same operation as in Example 4 to form the thermal expansion coefficient of the sealing material layer (sealing material layer Ci1: 73X 1 (T7 / ° C) sealant layer of the second glass substrate. thermal expansion difference IOX 10_7 / ° C Next, a first glass substrate is formed by alkali-free glass (thermal expansion coefficient a21:.. 38X1 (T / ° C), which is laminated to the second glass substrate a first glass substrate and the sealing material layer is a thermal expansion difference 35X1 (T7 / ° C. Thereafter, laser light is irradiated under the same conditions as in Example 4, the first glass substrate and the second glass substrate seal of the glass panel thus obtained appearance and airtightness was evaluated as described above. The results are shown in table 6. 本发明的带密封材料层的玻璃构件可作为玻璃基板用于制造平板型显示装置或太阳能电池板，该平板型显示装置或太阳能电池板具有在相向配置的两块玻璃基板之间密封有显示元件或太阳能电池元件的结构。  glass member with a sealing material layer according to the present invention can be used as a glass substrate for producing flat panel type display device or a solar cell panel, the flat panel type display device or a solar cell panel having a seal between two glass substrates disposed to face a display element or a solar cell structural elements. 此外，本发明的电子器件是具有上述结构的平板型显示装置或太阳能电池板。 Further, the electronic device of the present invention having the above structure is a flat type display device or a solar panel. 另外，这里引用2009年6月30日提出申请的日本专利申请2009-154954号和2010 年1月27日提出申请的日本专利申请2010-015143号的说明书、权利要求书、附图及摘要的全部内容作为本发明的说明书的揭示。  Further, the entire disclosure of Japanese Patent Application No. 2010-015143 Japanese Patent Application filed June 30, 2009 No. 2009-154954 filed and January 27, 2010, claims, and drawings summary is incorporated herein in its entirety. 1. 一种带密封材料层的玻璃构件，包括具有具备密封区域的表面的玻璃基板和形成在所述玻璃基板的所述密封区域上且厚度为15 ym以下的密封材料层，其特征在于， 所述密封材料层由对密封用玻璃材料烧成而成的材料形成，该密封用玻璃材料含有密封玻璃、激光吸收材料和任选的低膨胀填料，所述激光吸收材料和所述作为任选成分的低膨胀填料的总量在2〜44体积％的范围内， 并且所述密封材料层的材料的热膨胀系数ai与所述玻璃基板的热膨胀系数a 2的差在17〜65(X10_7/°C)的范围内。 A glass member with a sealing material layer, comprising a glass substrate having a surface provided with a sealing region and the sealing region is formed on the glass substrate and a sealing material layer having a thickness of 15 ym or less, wherein, the sealing material layer is formed on the glass material for sealing materials made of baked, sealing glass of the sealing glass material comprising a laser absorbing material and optionally the low-expansion filler and a laser absorbent material as said optionally ai difference between the thermal expansion coefficient of the glass substrate in thermal expansion coefficient a 2 of the total amount of the low-expansion filler component is in the range of 2~44% by volume, and the sealing material layer material 17~65 (X10_7 / ° the inner C) range. 2. 如权利要求1所述的带密封材料层的玻璃构件，其特征在于，相对于密封玻璃、激光吸收材料和低膨胀填料的总量，所述密封用玻璃材料含有2〜10体积％的范围内的所述激光吸收材料和〇〜40体积％的范围内的所述低膨胀填料。 2. The glass member provided with a sealing material layer according to claim 1, wherein the total amount of the sealing glass, a laser absorbent and a low-expansion filler, the glass material for sealing containing 2~10% by volume the range of the laser absorbent material and the low-expansion filler 〇~40 volume% of the range. 3. 如权利要求2所述的带密封材料层的玻璃构件，其特征在于，所述密封用玻璃材料含有10〜40体积％的范围内的所述低膨胀填料。 A glass member provided with a sealing material layer according to claim 2, characterized in that the sealing of the low-expansion filler comprises in the range of 10 ~ 40% by volume of the glass material. 4. 如权利要求1〜3中任一项所述的带密封材料层的玻璃构件，其特征在于，所述密封用玻璃材料内的激光吸收材料和低膨胀填料的总表面积在〇. 5〜6m2/cm3的范围内； 所述激光吸收材料和低膨胀填料的总表面积由[(激光吸收剂的比表面积）X (激光吸收剂的比重）X (激光吸收剂的含量（体积％ )) +(低膨胀填料的比表面积）X (低膨胀填料的比重）X(低膨胀填料的含量（体积％ ))]求出。 4. 1~3 glass member with a sealing material layer according to any one of the preceding claims, characterized in that the total surface area of ​​the laser light within the glass material for sealing the absorbent material and a low-expansion filler is square. -5 to the total surface area of ​​the laser absorbent and a low-expansion filler [(specific surface area of ​​the laser absorbent) X-(laser absorbent gravity) X-(content of the laser absorbent (vol%)) +; in the range of 6m2 / cm3 of (low-expansion filler specific surface area) X-(low-expansion filler gravity) X-(low-expansion filler content (vol%))] is obtained. 5. 如权利要求1〜3中任一项所述的带密封材料层的玻璃构件，其特征在于，所述低膨胀填料由选自二氧化硅、氧化铝、氧化锆、硅酸锆、堇青石、磷酸锆类化合物、钠钙玻璃和硼硅酸盐玻璃的至少1种材料形成。 5. 1~3 glass member with a sealing material layer according to any one of the preceding claims, characterized in that said low-expansion filler is selected from silica, alumina, zirconium oxide, zirconium silicate, cordierite at least one material selected from cordierite, zirconium phosphate compound, soda lime glass and borosilicate glass. 6. 如权利要求1〜3中任一项所述的带密封材料层的玻璃构件，其特征在于，所述激光吸收材料由选自Fe、Cr、Mn、Co、Ni和Cu的至少1种金属或者含有所述金属的化合物形成。 6. 1~3 glass member with a sealing material layer according to any one of the preceding claims, wherein said laser absorbing material at least one selected from Fe, Cr, Mn, Co, Ni and Cu a metal or a compound containing the metal is formed. 7. 如权利要求1〜3中任一项所述的带密封材料层的玻璃构件，其特征在于，所述玻璃基板由无碱玻璃或者钠钙玻璃形成，并且所述密封玻璃由铋类玻璃或者锡-磷酸类玻璃形成。 7. A member as claimed 1~3 glass with a sealing material layer according to any one of the sealing glass of bismuth-based glass, characterized in that the glass substrate is formed of soda lime glass or alkali-free glass, and the or tin - phosphate glass formed. 8. -种电子器件，包括具有具备第一密封区域的表面的第一玻璃基板、 具有具备与所述第一密封区域相对应的第二密封区域的表面并且以具备所述第二密封区域的表面与所述第一玻璃基板的具备所述第一密封区域的表面相向的方式设置的第二玻璃基板、 设置在所述第一玻璃基板和所述第二玻璃基板之间的电子元件部、 形成于所述第一玻璃基板的所述第一密封区域和所述第二玻璃基板的所述第二密封区域之间以密封所述电子元件部并且厚度为15 以下的密封层， 其特征在于，所述密封层由密封用玻璃材料的熔融固着层形成，该密封用玻璃材料含有密封玻璃、激光吸收材料和任选的低膨胀填料，所述激光吸收材料和所述作为任选成分的低膨胀填料的总量在2〜44体积％的范围内， 并且所述密封层的材料的热膨胀系数ai与所述第一玻璃基板及第二玻璃基板 8. - electronic device, comprising a first glass substrate having a surface provided with a first sealing region, having a first sealing region provided with the second sealing region corresponding to the surface and the second sealing region comprising the second surface includes a glass substrate and the first surface of the glass substrate facing the first sealing region is provided, an electronic element portion disposed between the first glass substrate and the second glass substrate, between said first glass substrate is formed in said first region and said second sealing glass substrate to seal the second sealing region of the electronic element unit 15 or less and a thickness of the sealing layer, characterized in that the sealing layer is formed from a molten glass material for sealing the fixing layer, the glass seal comprising a sealing glass material, a laser absorbing material and optionally the low-expansion filler and a laser absorbent material as an optional component of the low expansion filler amount in the range of 2~44% by volume, and the thermal expansion coefficient of the material of the sealing layer ai glass substrate and the first substrate and the second glass 的至少一方的热膨胀系数a2的差在17〜65(X1(T7/°C )的范围内。 At least one of a thermal expansion coefficient a2 is in 17~65 the difference (range X1 (T7 / ° C) of. 9. 如权利要求8所述的电子器件，其特征在于，所述第一玻璃基板的热膨胀系数a 21和所述第二玻璃基板的热膨胀系数a 22与所述密封层的材料的热膨胀系数a ,的差都在17〜 65(X1(T7/°C )的范围内。 9. The electronic device according to claim 8, wherein the thermal expansion coefficient of a material of thermal expansion coefficient of the first glass substrate 21 is a glass substrate and the second sealing layer 22 and the thermal expansion coefficient a , the difference in the 17~ 65 (range X1 (T7 / ° C) of. 10. 如权利要求8所述的电子器件，其特征在于，所述第一玻璃基板的热膨胀系数a 21和所述第二玻璃基板的热膨胀系数a 22中任何一方的热膨胀系数与所述密封层的材料的热膨胀系数a :的差在17〜65 (X1(T/°C )的范围内，且另一方的热膨胀系数与所述密封层的材料的热膨胀系数ai的差小于17X1(T7/°C。 10. The electronic device according to claim 8, characterized in that the thermal expansion coefficient of the first glass substrate, a 21 and a thermal expansion coefficient of the second glass substrate in either a 22 thermal expansion coefficient of the sealing layer the thermal expansion coefficient of the material of a: 17~65 the difference (X1 (T / ° C) range, and coefficient of thermal expansion of the thermal expansion coefficient of the sealing layer is less than the other ai 17X1 (T7 / ° C.
11. 如权利要求8〜10中任一项所述的电子器件，其特征在于，所述密封用玻璃材料内的激光吸收材料和低膨胀填料的总表面积在0. 5〜6m2/cm3的范围内； 所述激光吸收材料和低膨胀填料的总表面积由[(激光吸收剂的比表面积）X (激光吸收剂的比重）X (激光吸收剂的含量（体积％ )) +(低膨胀填料的比表面积）X (低膨胀填料的比重）X(低膨胀填料的含量（体积％ ))]求出。 11. The electronic device of any one of 8~10 claims, characterized in that the total surface area of ​​the laser light within the glass material for sealing the absorbent material and a low-expansion filler in the range of 0. 5~6m2 / cm3 of within; the total surface area of ​​the laser absorbent and a low-expansion filler filler [(specific gravity of the laser absorbent) X + (low-expansion (laser absorbent content (vol%)) (specific surface area of ​​the laser absorbent) X is (content (low-expansion filler proportion of low-expansion filler) X-(vol%) specific Surface Area) X-)] is obtained. 12. -种电子器件的制造方法，包括准备具有具备第一密封区域的表面的第一玻璃基板的工序； 准备具有具备与所述第一密封区域相对应的第二密封区域和形成在所述第二密封区域上并且厚度为15 ym以下的密封材料层的表面的第二玻璃基板的工序； 使所述第一玻璃基板的具备所述第一密封区域的表面与所述第二玻璃基板的具备所述第二密封区域的表面相向，并隔着所述密封材料层将所述第一玻璃基板和所述第二玻璃基板层置的工序； 透过所述第一玻璃基板或者所述第二玻璃基板对所述密封材料层照射激光，使所述密封材料层熔融，从而形成将设置于所述第一玻璃基板和所述第二玻璃基板之间的电子元件部密封的密封层的工序， 其特征在于，所述密封材料层由对密封用玻璃材料烧成而成的材料形成，该密封用玻璃材料含有密封玻璃、激光吸收材料和 12. - Method for manufacturing electronic device comprising a first step of preparing a glass substrate having a sealing region comprising a first surface; preparing a second sealing region includes the region corresponding to the first seal and formed in said a second sealing region and a thickness of 15 ym or less a step surface of the second glass substrate a sealing material layer; the first glass substrate comprising a surface region of said first seal and said second glass substrate includes a surface facing the second sealing region, the sealing material layer interposed therebetween and the first step of the substrate layer and the glass substrate opposed to the second glass; glass substrate through the first or the second glass substrates of the sealing material layer is irradiated with laser light, the sealing material layer is melted, thereby forming a step portion between the electronic component provided in the first substrate and the second glass substrate sealing glass sealing layer characterized in that the sealing material layer is formed on the glass material for sealing materials made of baked, sealing glass of the sealing glass material comprising a laser absorbing material and 选的低膨胀填料，所述激光吸收材料和所述作为任选成分的低膨胀填料的总量在2〜44体积％的范围内， 并且所述密封材料层的材料的热膨胀系数ai与所述第一玻璃基板和所述第二玻璃基板中的至少一方的热膨胀系数a 2的差在17〜65 (X10_7/°C )的范围内。 The total amount of selected low-expansion filler, and a laser absorbent as the low-expansion filler is an optional ingredient in the range of 2~44% by volume, and the coefficient of thermal expansion of the sealing material layer and the ai at least one of a thermal expansion coefficient difference between the first glass substrate and the second glass substrate 2 in the range of 17~65 (X10_7 / ° C) of. 13. 如权利要求12所述的电子器件的制造方法，其特征在于，所述第一玻璃基板的热膨胀系数a 21和所述第二玻璃基板的热膨胀系数a 22与所述密封材料层的材料的热膨胀系数h的差都在17〜65(X1(T7/°C )的范围内。 13. The method of manufacturing an electronic device according to claim 12, characterized in that the thermal expansion coefficient of the first glass substrate 21 is a thermal expansion coefficient of the second glass substrate 22 with a material of the sealing material layer the difference in coefficient of thermal expansion are the h (range X1 (T7 / ° C) at 17~65. 14. 如权利要求12所述的电子器件的制造方法，其特征在于，所述第一玻璃基板的热膨胀系数a 21和所述第二玻璃基板的热膨胀系数a 22中任何一方的热膨胀系数与所述密封材料层的材料的热膨胀系数的差在17〜65(XKT7/°C)的范围内，且另一方的热膨胀系数与所述密封材料层的材料的热膨胀系数ai的差小于17X1(T7/°C。 14. The method of manufacturing an electronic device according to claim 12, characterized in that the thermal expansion coefficient of the first glass substrate, a 21 and the second thermal expansion coefficient of the glass substrate in a 22 to any one of the coefficient of thermal expansion difference in the thermal expansion coefficient of the material of said sealing material layer is in the range of 17~65 (XKT7 / ° C), and the thermal expansion coefficient of the thermal expansion coefficient of the sealing material layer of the other material is less than the ai 17X1 (T7 / ° C.
15. 如权利要求12〜14中任一项所述的电子器件的制造方法，其特征在于，所述密封用玻璃材料内的激光吸收材料和低膨胀填料的总表面积在〇. 5〜6m2/cm3的范围内； 所述激光吸收材料和低膨胀填料的总表面积由[(激光吸收剂的比表面积）X (激光吸收剂的比重）X (激光吸收剂的含量（体积％ )) +(低膨胀填料的比表面积）X (低膨胀填料的比重）X(低膨胀填料的含量（体积％ ))]求出。 15. The method of manufacturing an electronic device according to any one of 12~14 claims, characterized in that the total surface area of ​​the laser light within the glass material for sealing the absorbent material and a low-expansion filler is square. 5~6m2 / cm3 of the range; the total surface area of ​​the laser absorbent and a low-expansion filler [(specific surface area of ​​the laser absorbent) X-(laser absorbent gravity) X-(laser absorbent content (vol%)) + (low expansion filler specific surface area) X-(low-expansion filler gravity) X-(content of the low-expansion filler (vol%))] is obtained.